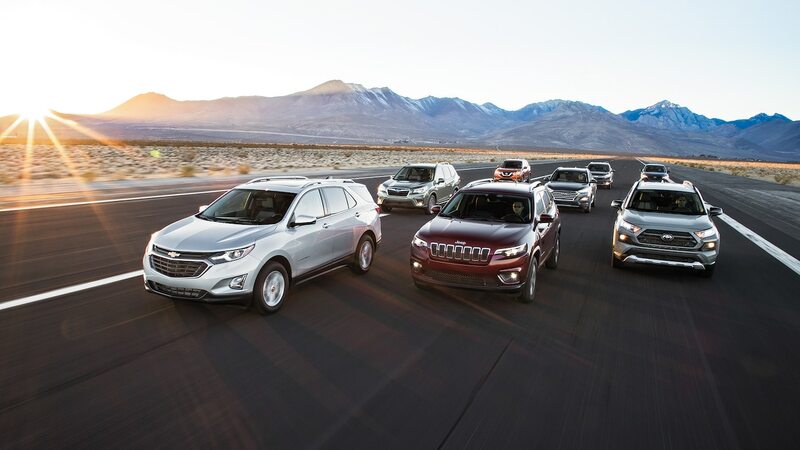 Why buy a family sedan when the new generation of compact crossovers is this good? 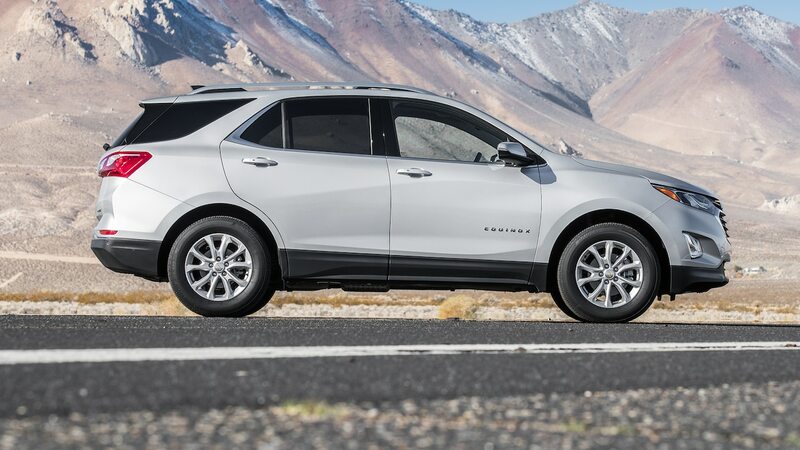 It’s hardly a news flash if you’ve been paying attention: Over the past decade, American families have dumped their family sedans for compact SUVs. Such a transformation in automotive preferences is nearly unprecedented: Car-based compact crossovers have become the best-selling passenger vehicles in the United States—second only to full-size pickups—and odds are you and/or most of your neighbors have one in the driveway. We did a comparison test of this grouping just a few short years ago, but because this red-hot segment is so competitive, many of the players have undergone significant changes of late. 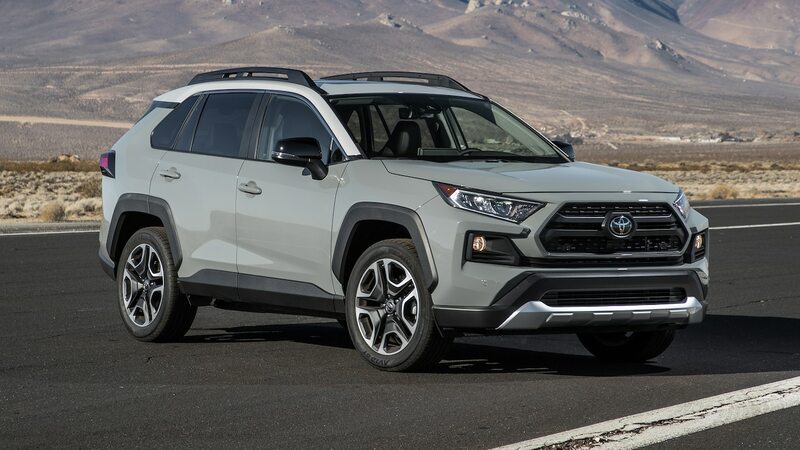 To keep your knowledge up to date as far as who makes the best small SUV right now, we have assembled the eight most important compact crossovers on the market. Who lays claim to bragging rights this time around? What if someone took the very best elements from all these crossovers and mashed them into a single, perfect crossover? 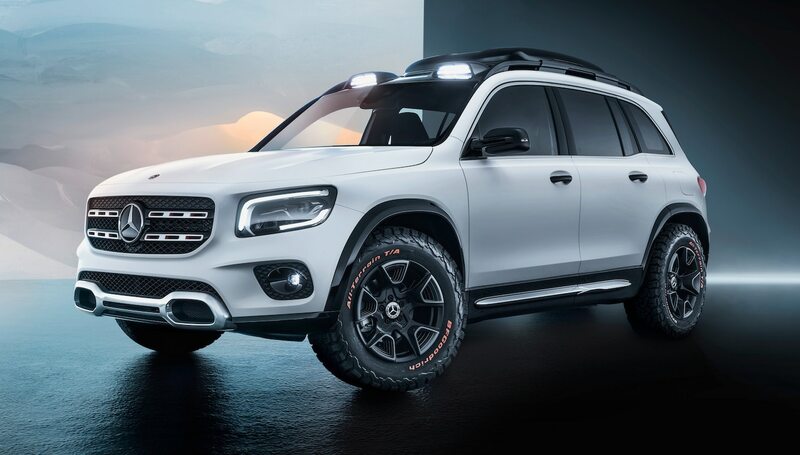 Check out our FrankenSUV here. 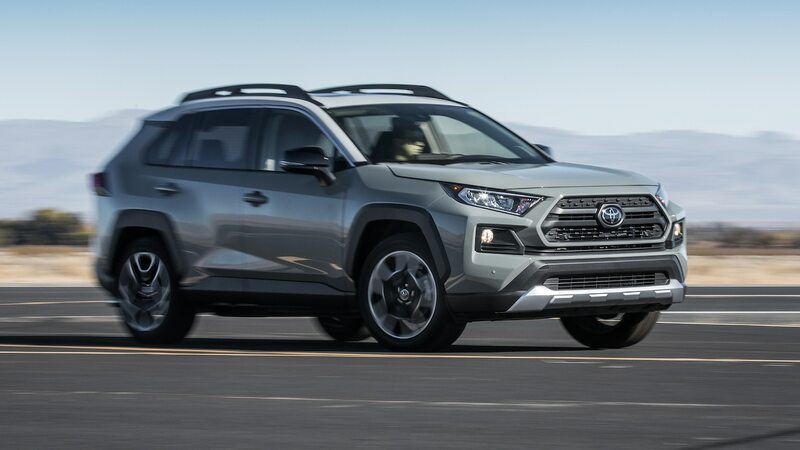 There’s a lot of pressure on the newest entry in our group, the 2019 Toyota RAV4, especially as it replaces the best-selling passenger vehicle in the United States. (The outgoing RAV4 uprooted the Camry’s decade-plus reign of dominance.) Our Adventure trim signifies the ongoing shift Toyota is making with its best-seller. Its stylish sheetmetal is matched by a colorful cabin that’s more than tones and textures—it also reveals attention to detail. With a 203-hp 2.5-liter I-4 paired with an eight-speed automatic, it has the most powerful standard engine in this group. On paper, there’s a lot going right here. 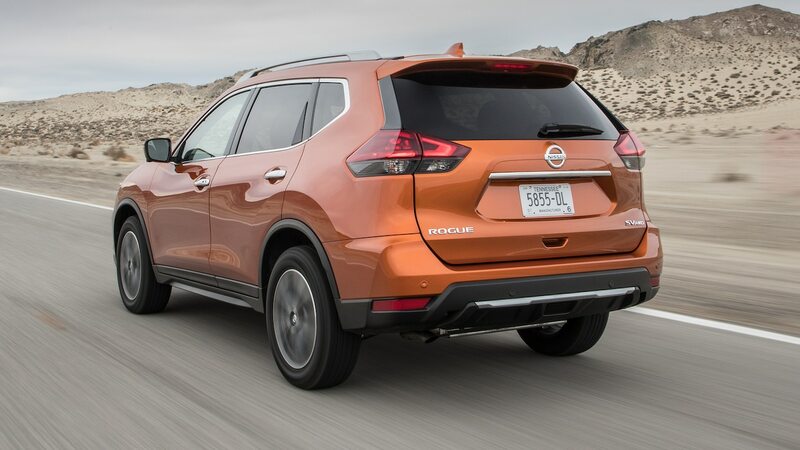 A partial testament to the power of low-APR loans, the Nissan Rogue is hot on the Toyota’s heels in the sales race. 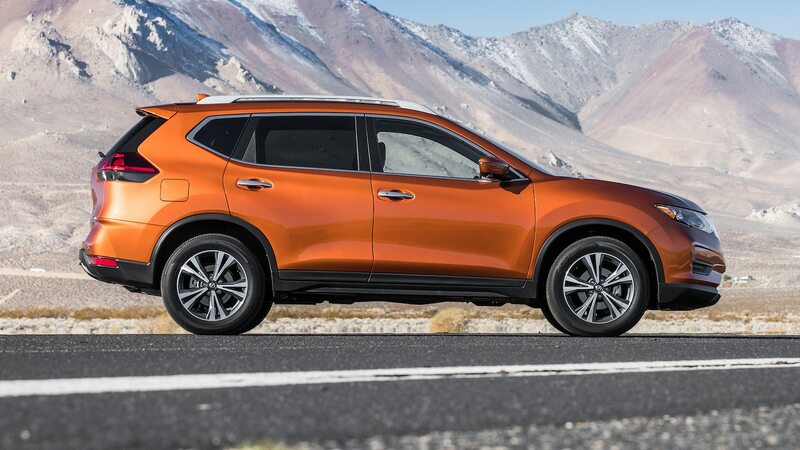 The 2019 Rogue SV is aging rather well. 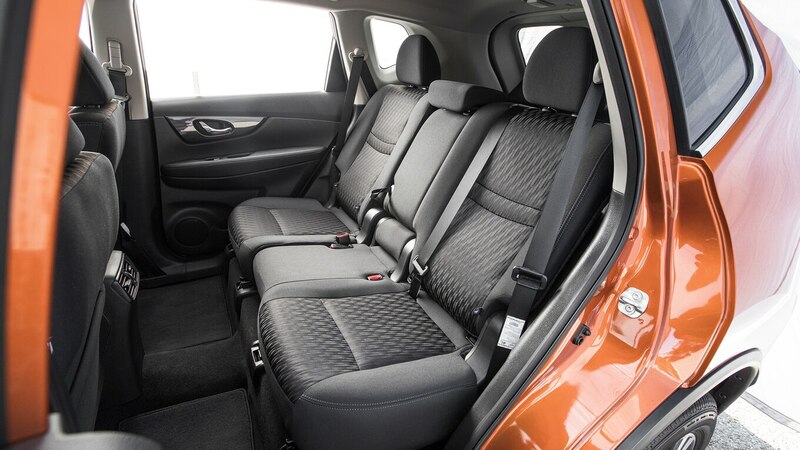 There’s still enough to like about this scrappy crossover, such as its cushy, roomy back seat and innovative cargo hold. Like the Toyota, the Rogue is motivated by a 2.5-liter I-4, this one making just 170 hp and paired with a CVT. The Honda CR-V is not only Honda’s best-selling vehicle but was also our 2018 SUV of the Year. 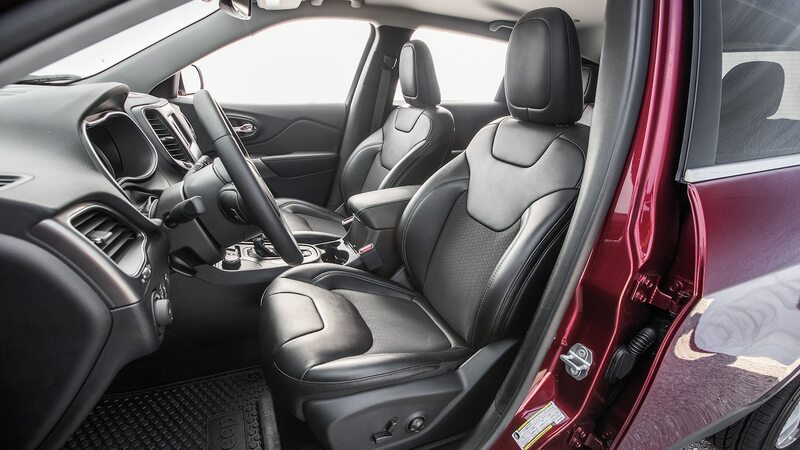 We crowned this spacious crossover because it does so much so well, from its intelligently designed interior and segment-best driver-assist technology to its exceptional road manners. 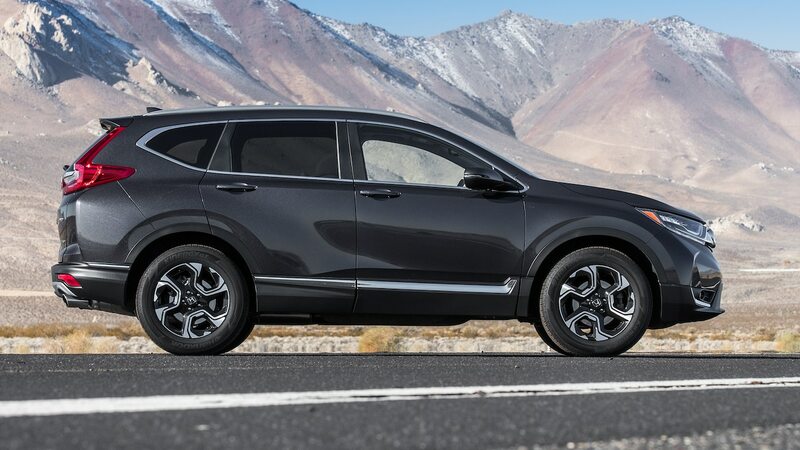 Our 2019 CR-V EX-L tester features the optional 1.5-liter turbocharged mill that so charmed us when it won its honors. With all this new sheetmetal present, does it still have what it takes to win a Big Test? The recently refreshed 2019 Jeep Cherokee is hungry to eat into the Japanese Three’s sales. With a new nose and tail, a crash diet, and a revvy new optional powertrain borrowed from the fantastic Alfa Romeo Giulia and Stelvio, Jeep hopes the Cherkoee Latitude can make up for its ninth-place finish last time. 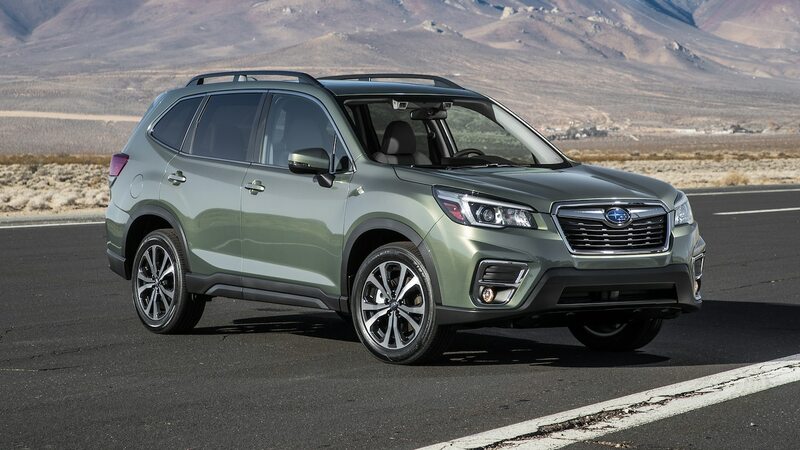 Rivaling the Jeep in the off-road credibility department is the redesigned-for-2019 Subaru Forester. The Forester (the Limited trim in our test) moves to a modular platform with refreshed sheetmetal, a roomier cabin, and all-wheel drive for those harsh northern winters. 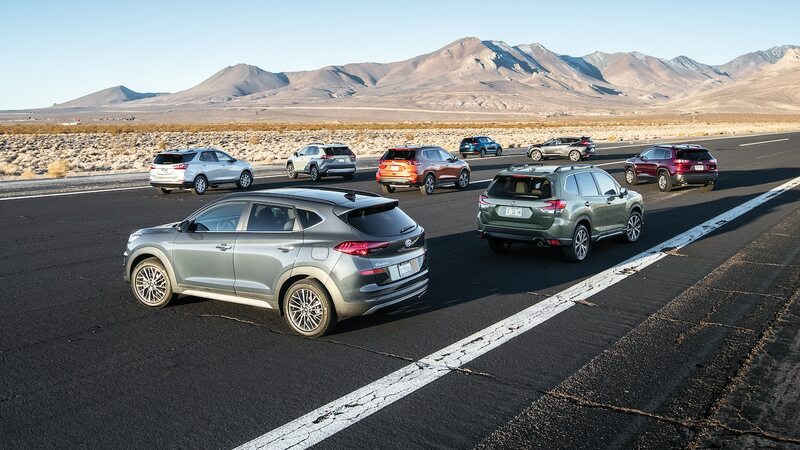 The last time we Big Tested this segment, the Hyundai Tucson earned a surprising third-place finish. With a little more powertrain refinement, we said Hyundai could have won the whole shebang. 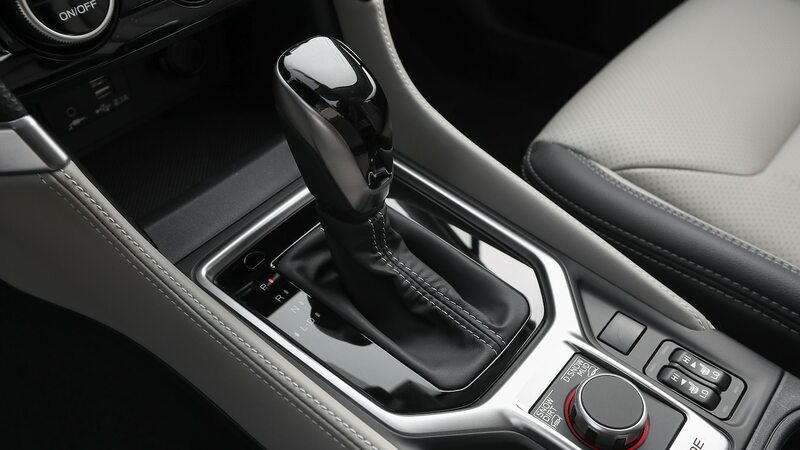 The Korean automaker has appeared to take that lesson to heart, replacing its jerky twin-clutch transmission with a six-speed auto last year. Our 2019 Tucson Ultimate tester has a 181-hp 2.4-liter I-4 bolted to its new six-speed. 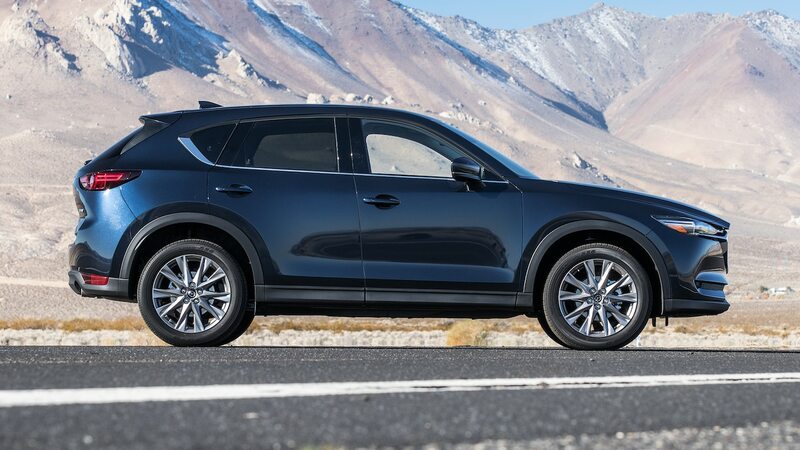 Although its sales numbers don’t back it up, the Mazda CX-5 (represented here by the Grand Touring) has long been a fan favorite for its focus on rewarding the driver rather than being a mere schlepping appliance. 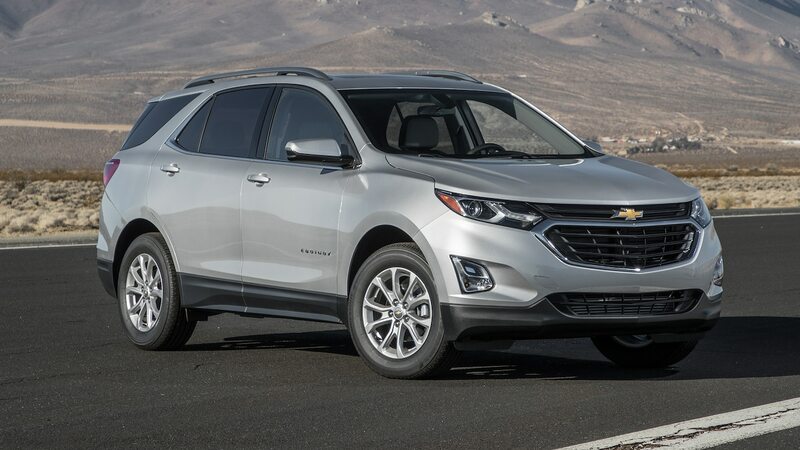 Having shrunk in size to make room for the Blazer, the 2019 Chevrolet Equinox LT also moved to smaller, more efficient engines—such as our tester’s 170-hp 1.5-liter turbo-four mated to a six-speed automatic transmission. We asked Ford for an Escape, but Blue Oval PR said none was available for testing. Not much has changed for the Escape since it finished sixth last time around, though, so finishing anywhere but near the bottom was unlikely. To level the playing field, our eight competitors were equipped as similarly as possible. All came with all-wheel drive. Seven of our eight testers stickered for $34,000 USD or less—save for the RAV4, which carries an eye-watering $38,865 USD window sticker. We’ll keep that price in mind in our final ranking. Our Big Tests are more about daily living than tearing up the track. As such, the winner has to be practical, and it must balance boring stuff like value, cost of ownership, safety, and efficiency. Still, it has to be rewarding to drive and own. The reason most family haulers get such a bad rap is because they’ve typically handled about as well as a box truck, rode like they were suspended from wet noodles, and had about as much power as a Bird scooter. Thankfully, most automakers nowadays realize they’ve got a lot to lose by cheaping out on dynamics. No doubt about it, the athlete of the group is the Mazda CX-5. There’s such a sense of purity and playfulness in the way the CX-5 goes down the road. 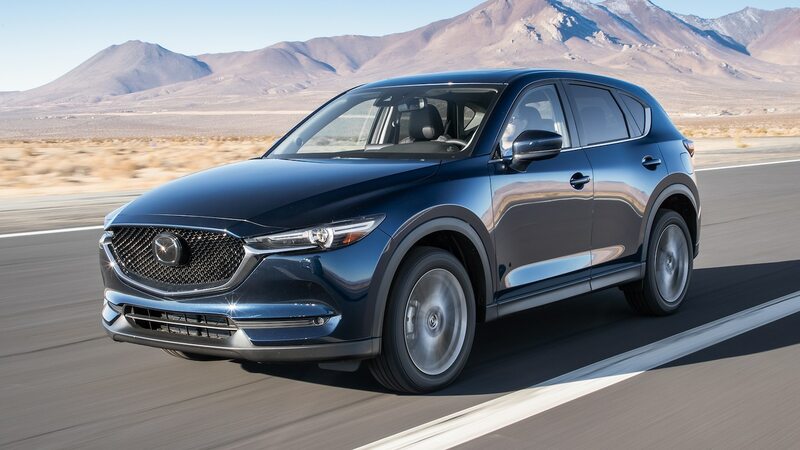 “Every time you get in a Mazda, you can feel that it was made by drivers, for drivers,” features editor Scott Evans said. 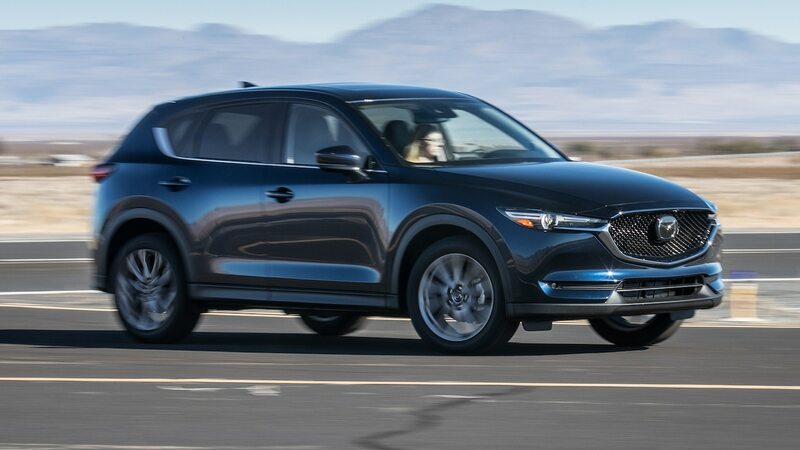 Powered by its standard 187-hp 2.5-liter I-4, the Mazda’s horsepower is midpack, but its four-pot has a sporty snarl to it, and it rewards drivers who keep their foot buried in the throttle. 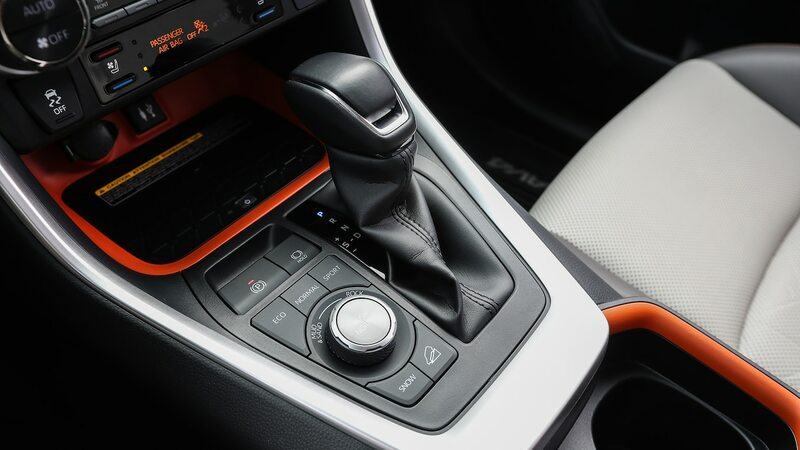 The six-speed automatic, shifting quickly and unafraid to hold gears, doesn’t feel as old as it is. 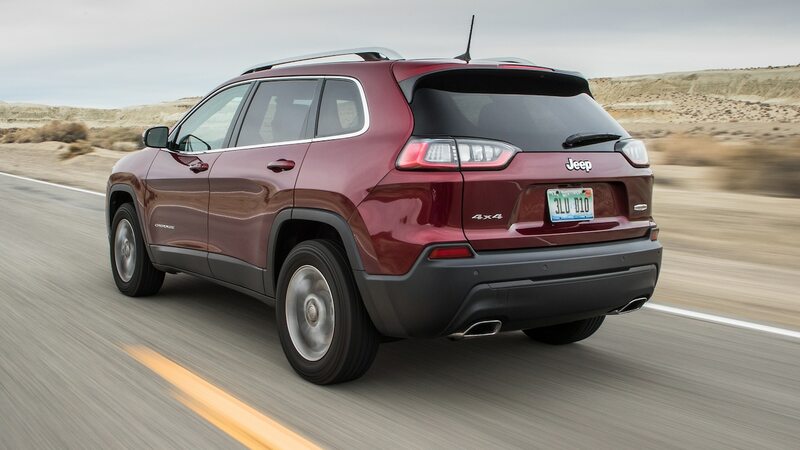 If the CX-5 is the canyon carver of the bunch, the Jeep Cherokee is the drag racer. 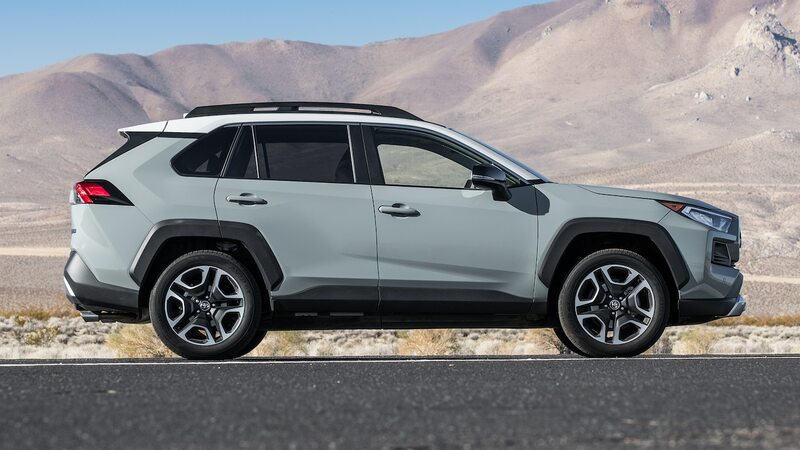 Unsurprisingly, given its nearly 70-hp advantage over the next most powerful competitor, the RAV4, the Cherokee is the quickest crossover in our group. “What an engine!” senior production editor Zach Gale said. 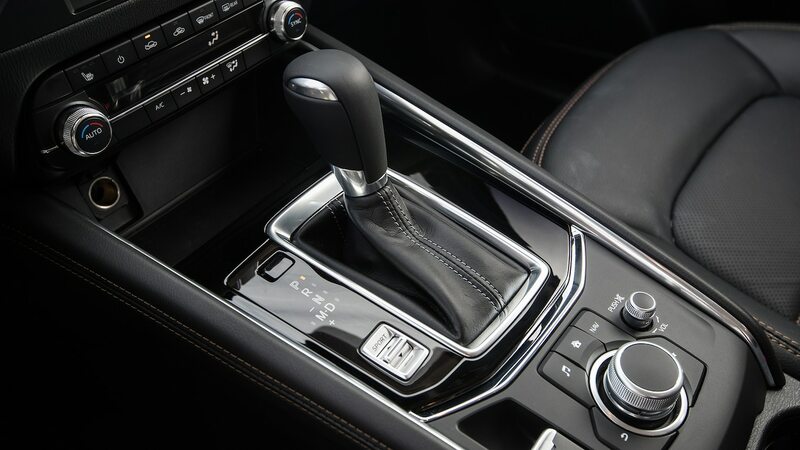 Jeep’s infamous nine-speed automatic appears to be cured of most of its ills with this update, too. Shifts are generally smooth and decisive, though a few editors noted some bad behavior and clunkiness in heavy L.A. traffic and in parking lots. 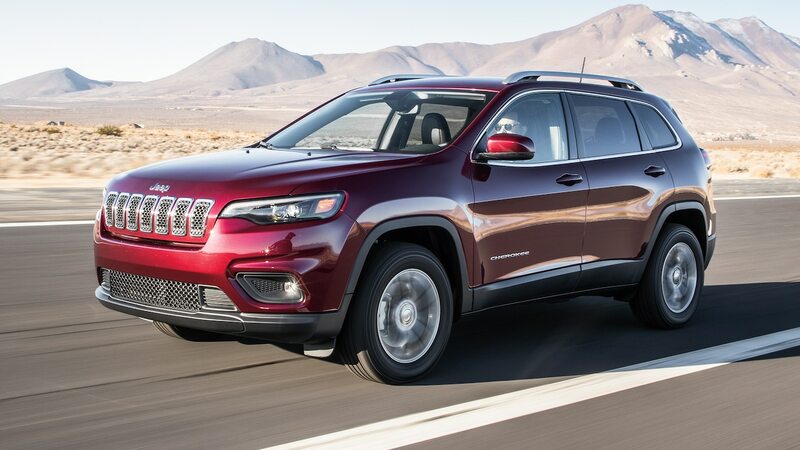 The Cherokee’s ride and handling balance is best described as charming. Despite being built—like all others here—on a compact sedan platform, the Jeep feels remarkably trucklike. 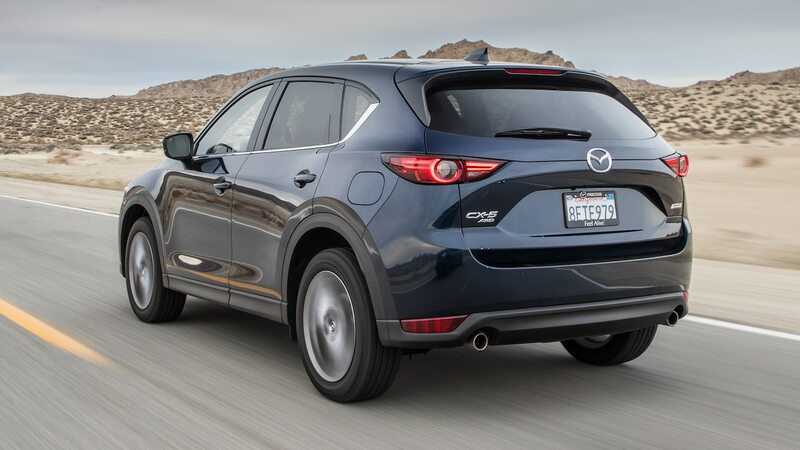 Its ride is stiff but not punishing, and steering is slow; that isn’t exactly rewarding, but rarely do these family CUVs provide the same satisfaction through turns that the Mazda does. The Honda CR-V does come pretty close, though. Its 190-hp turbo-four has just a hint of turbo lag, but it feels powerful no matter what you throw at it. 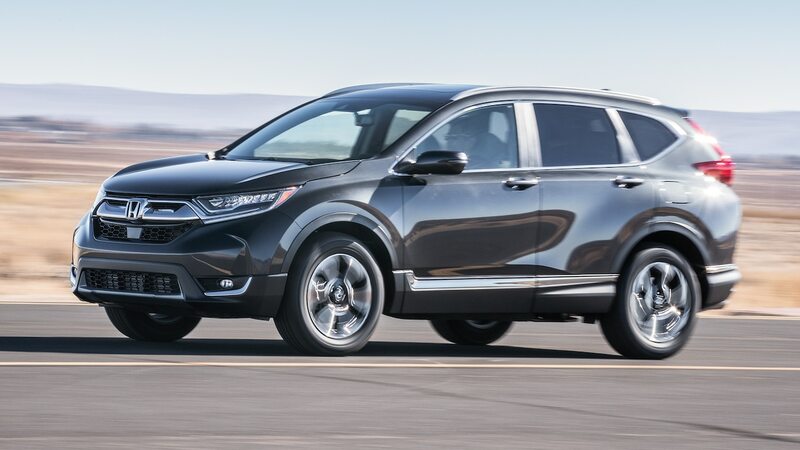 The CR-V’s engine punches above its weight and is just as happy loafing around town as it is passing that slow Prius camped out in the left lane. 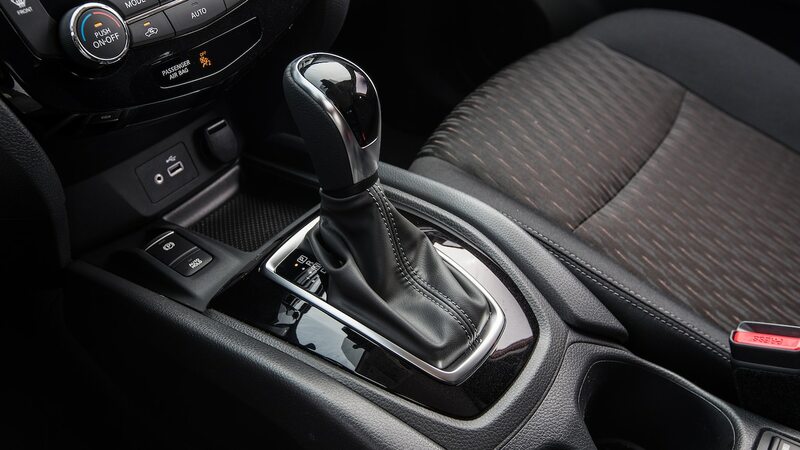 Normally we aren’t fans of the drony feel of continuously variable transmissions, but this is one terrific CVT. 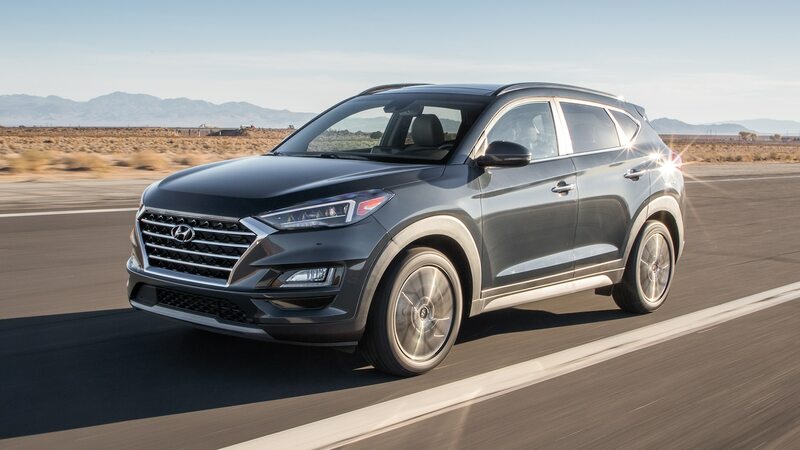 The Jeep, Honda, and Mazda all comfortably assert their personalities on the road, but the Hyundai Tucson is a bit of a wallflower. 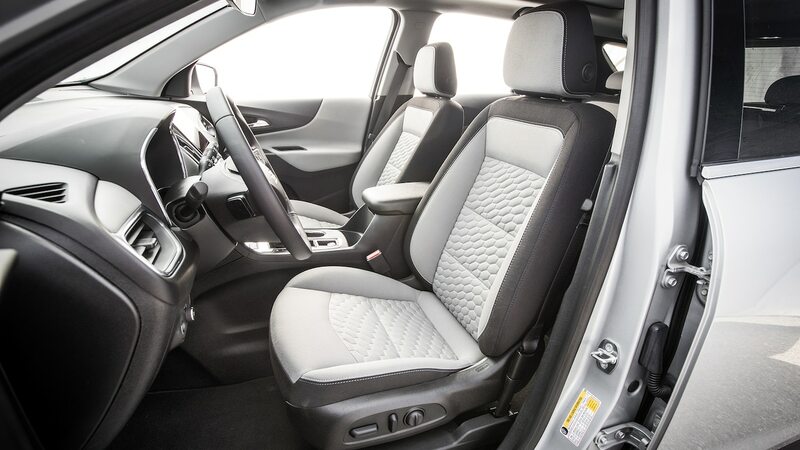 The Tucson is happy to work hard but would prefer if you just take it easy. Its powertrain feels more than competent in the flow of traffic, its automatic smoothly shunting from gear to gear, but the engine starts sounding thrashy when pushed. Its ride and handling behavior is similarly inoffensive. 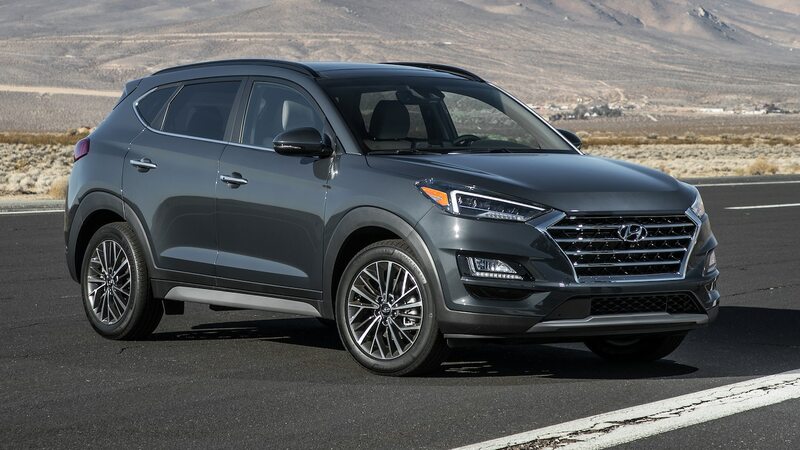 “The Tucson took a set in turns quite predictably and generally exhibited little or no bad behavior,” technical director Frank Markus said. 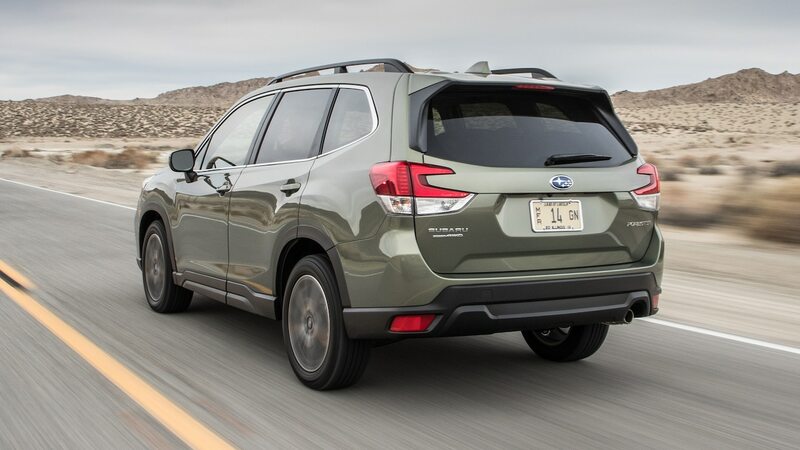 The Tucson may be a bit forgettable, but the Subaru Forester isn’t—and not for the reasons you’d want it to be. 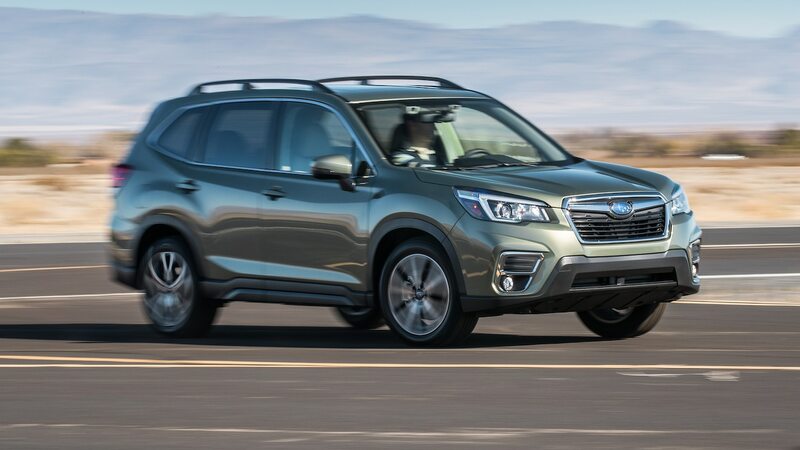 Subarus have traditionally had a utilitarian charm going for them—they’ve been a bit underpowered, but they typically ride and handle wonderfully. 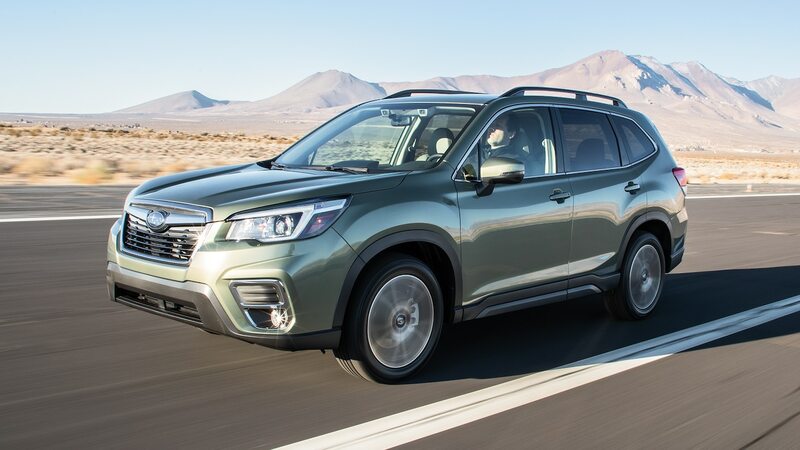 The big new Forester maintains its underpowered tendencies to a fault; unfortunately, it doesn’t deliver on the ride or handling qualities we expect from Subaru. “I’m pretty fed up with the ride after 20 minutes,” Rechtin said. He’s not alone. The Forester galumphs down the road like an old Cadillac, even the smallest of bumps making the Subaru porpoise on its bump stops. If a member of your family is prone to carsickness, move along. The Subie’s gravelly 2.5-liter flat-four makes what should be a sufficient 182 hp, and it is aided around town by aggressive CVT tuning. But under acceleration off the line and in passing maneuvers, the Forester is just plain poky—and that was with just an editor flying solo. 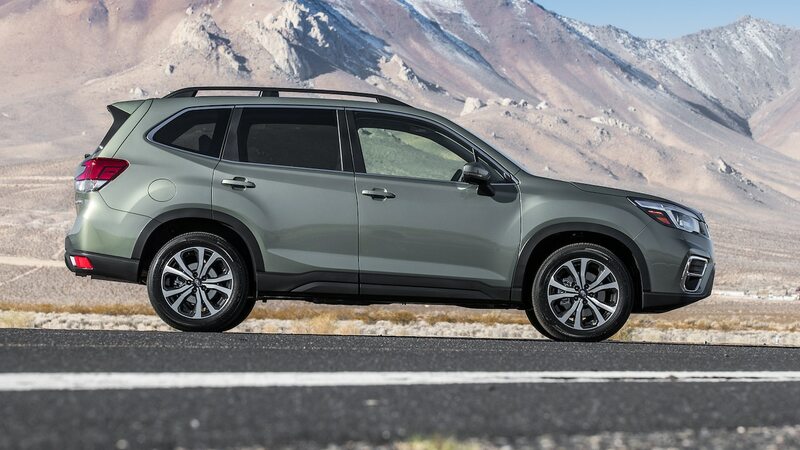 The RAV4 is another new model that’s disappointing on the road. The old model was never a segment performance leader, but we’re nonetheless pretty bummed that Toyota’s engineers didn’t appear to do as much work as its designers. 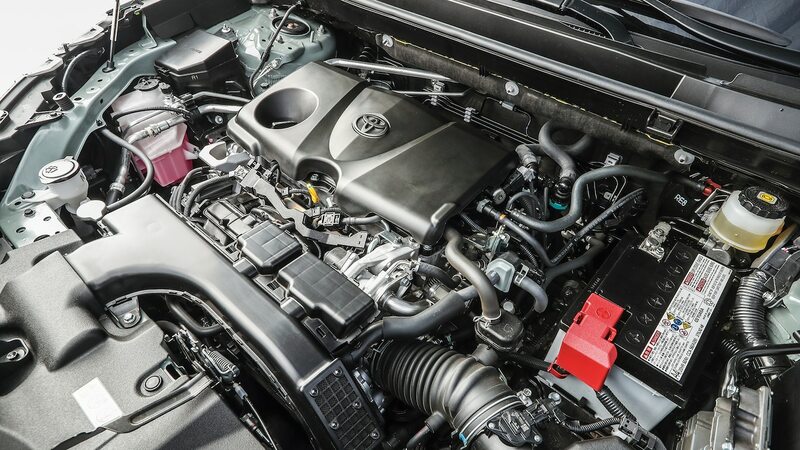 Despite all its horsepower, the Toyota’s new engine seems outmatched. The buzzy engine “feels like it’s straining when you ask for modest acceleration, and after every rough upshift, the engine seems to be struggling to keep the momentum,” Evans said. 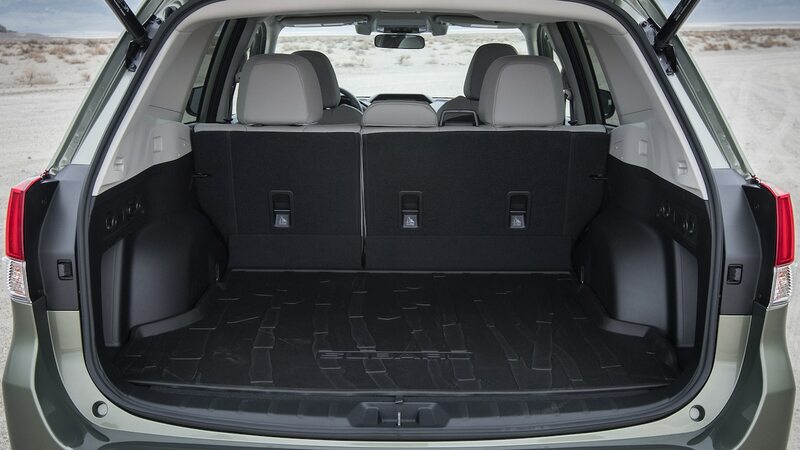 The RAV4’s ride quality is bottom of the pack, too, with lots of head toss, gut jiggle, and a fair amount of roll through corners. We expected better. After piloting a Rogue for a year as part of our long-term test program, I have a soft spot for Nissan’s crossover. But nostalgia can’t cover up the cavities on this long-in-the-tooth model. First the good—the Nissan’s powertrain is generally strong, even if it’s noisy and prone to the dreaded CVT drone. But the Nissan falters in its ride and handling experience. Where others have evolved, the Rogue is sloppy in anything but a straight line. Steering is heavy and unresponsive, and once the Rogue does respond to your input, it hunkers over like a sailboat that just crossed the wind. 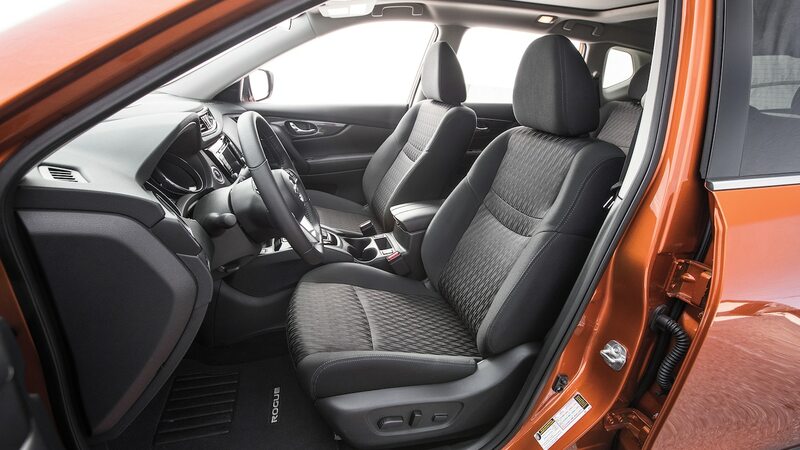 What’s inside can be just as important as how a family crossover drives. And despite the similar footprints, there’s a clear difference in philosophies at play here. Some seek to maximize space for people, others for cargo, while a couple focus purely on aesthetics at the cost of functionality. The Honda CR-V is a packaging marvel, no getting around it. How Honda managed to cram that much usable space in one of the smallest physical packages defies logic. 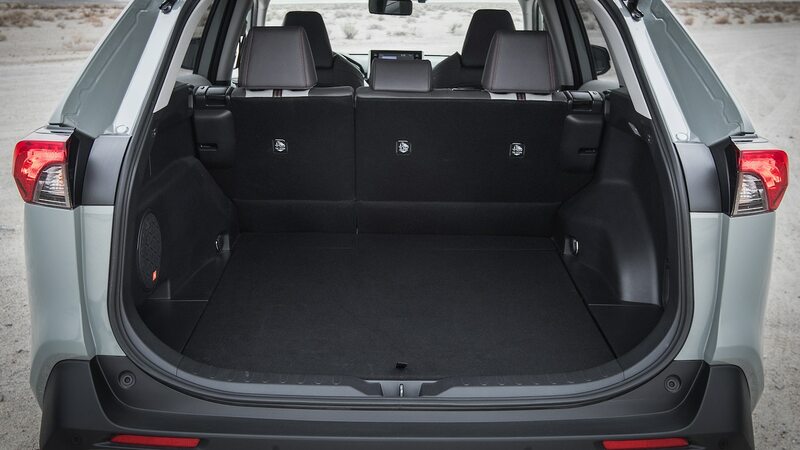 By the numbers, the CR-V leads in both cargo volume and rear passenger space, and it’s near tops in front passenger space, too. Numbers sometimes lie, but Honda’s don’t. “The rear seat has tons of space,” 6-foot-4 “Stilts” Gale said. 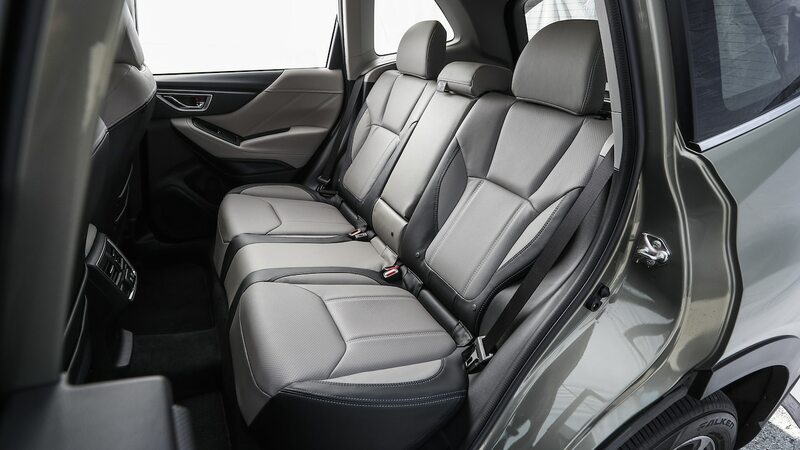 Aside from space, the CR-V really delivers in the experience. All materials are pleasing to the touch, and the mix of colors and textures provides an open-air feel. 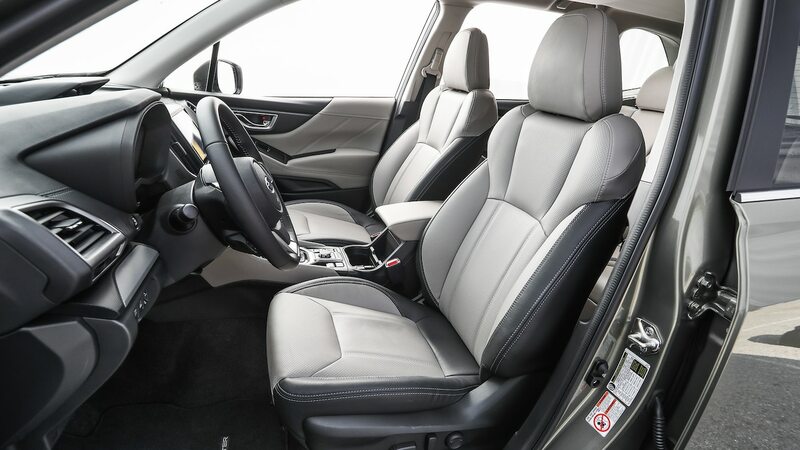 The Honda’s multiple cubbies, cupholders, and USB outlets throughout the cabin and massive center console with a sliding lid all win points. The CR-V’s biggest miss? Its infotainment system. Honda helpfully brought back a volume knob for the 2017 model year, but the system is as arduous as going to the DMV. Thankfully, Apple CarPlay compatibility means you can mostly avoid Honda’s unresponsive, cluttered, and laggy native infotainment software. 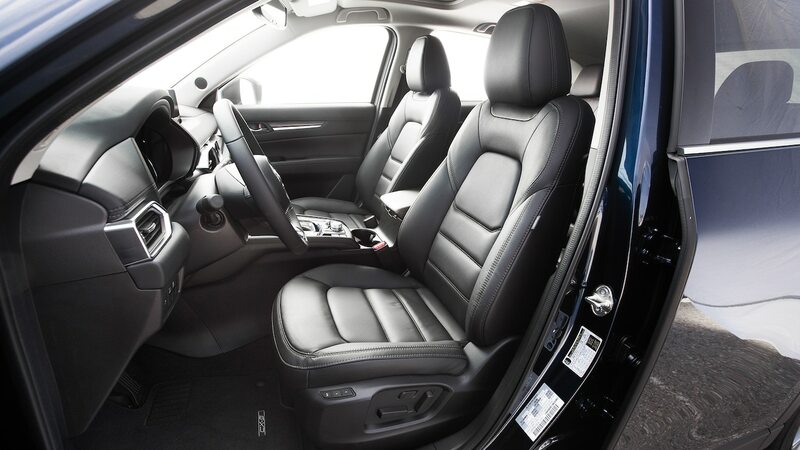 The Subaru Forester provides a thoughtfully designed cabin. Swing the wide-opening doors, and you’ll find a utilitarian but high-quality space with an interesting mix of colors, textures, and materials. “It feels like you’re getting your money’s worth,” Rechtin said. 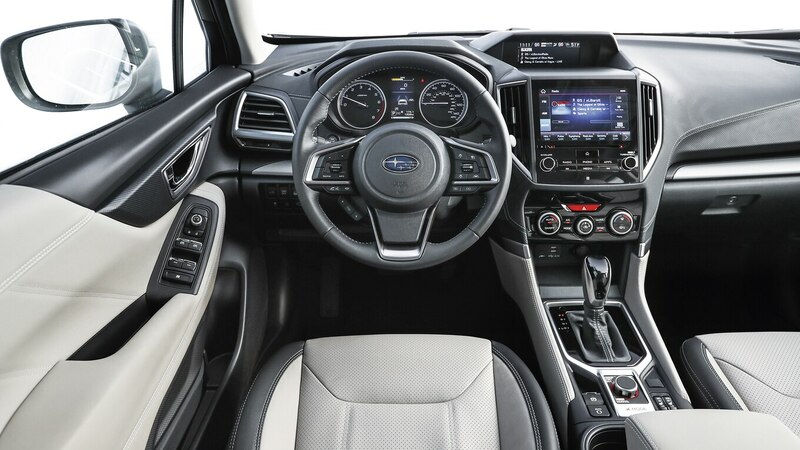 When it comes to design and features, the Subaru also scored high marks for its twin infotainment displays on the center stack. 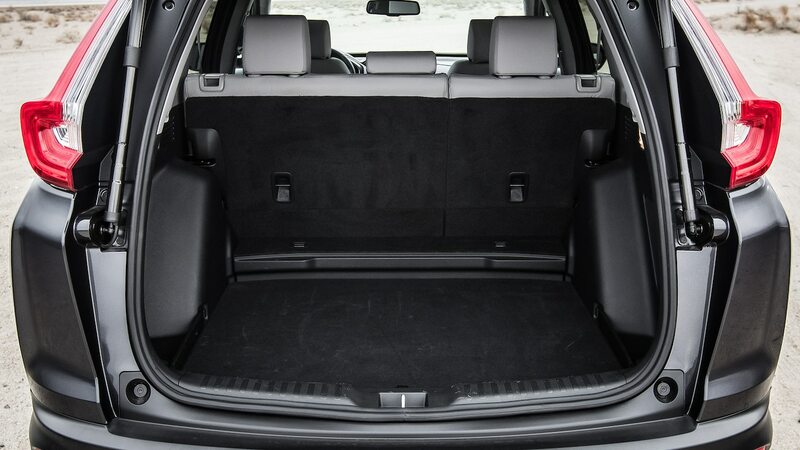 The Forester’s cabin is especially roomy with a spacious back seat and cargo area and a yawning rear hatch. Its fishbowl-like greenhouse is perfect to take in the sights of a national park. 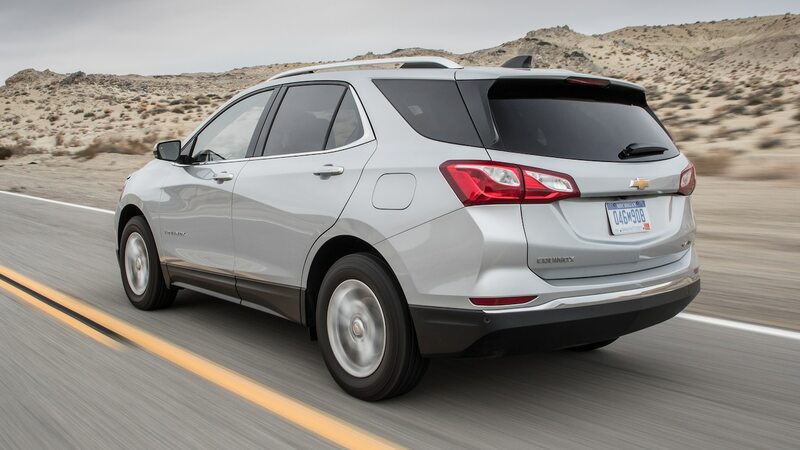 Like the Honda and Subaru, the Equinox is spacious—but that’s where the similarities end. The Japanese entries delighted us with their inherent quality, which isn’t the case with the Chevy. 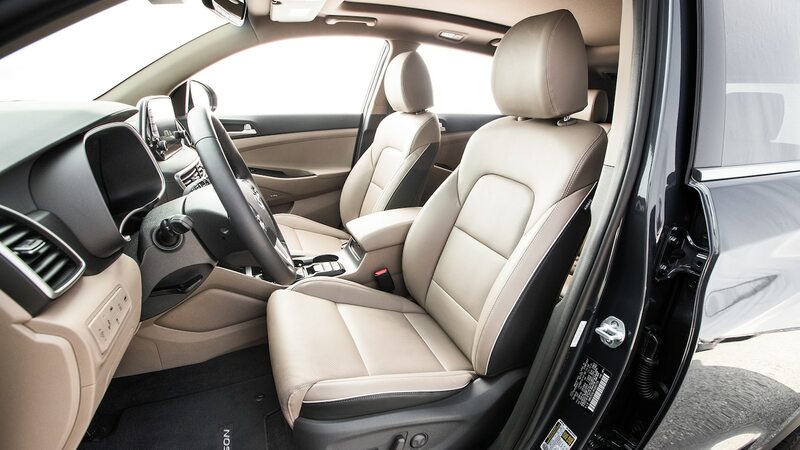 “Everything about this Equinox screams rental car,” Markus said. 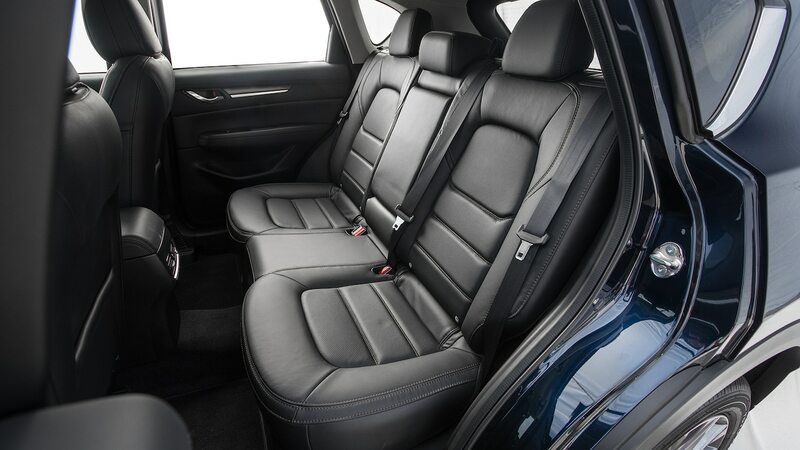 “The cloth seats, the hard plastic everywhere you look—the only thing that doesn’t scream rental car is the $34,330 USD price tag.” He was just getting teed up: “Actually this interior is kind of the worst of both worlds; they’ve spent the money on soft materials, but they gave them a grain and gloss level that looks cheap.” The only saving graces are the Chevy’s intuitive infotainment system and its back-seat package, which has great legroom thanks to its flat floor. 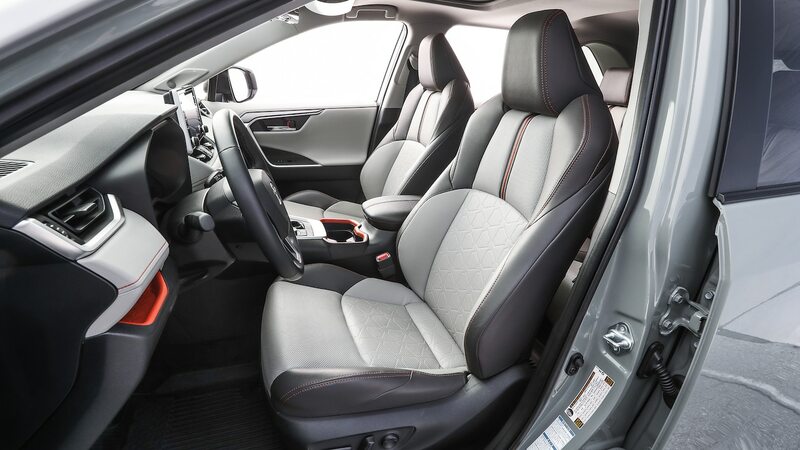 Grotty interior quality is also the bane of the Nissan Rogue—calling to mind a subway car, with a hodgepodge of seemingly random plastics throughout. Nissan’s infotainment system has the resolution of a closed-circuit security camera and is about as user-friendly as one, too. 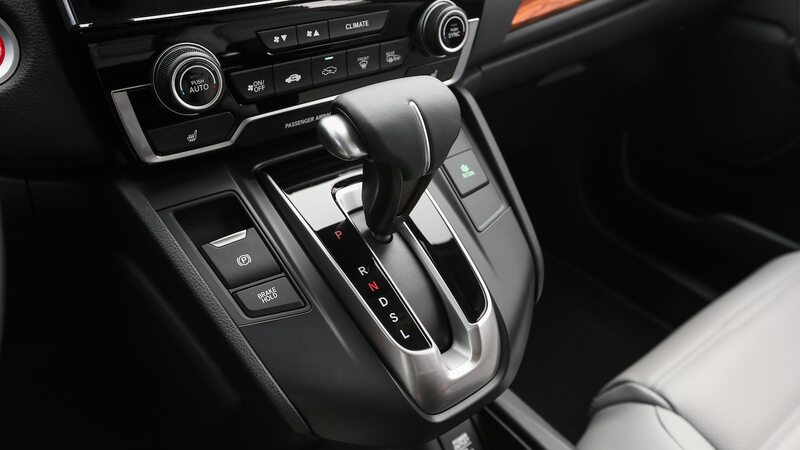 The Rogue’s plasticky flat-bottom steering wheel took flak (“Why does it have a flat-bottom steering wheel if it’s not sporty at all?” associate online editor Kelly Pleskot asked), as did the eight inscrutable buttons placed near the driver’s left kneecap. But even a Rogue deserves redemption. 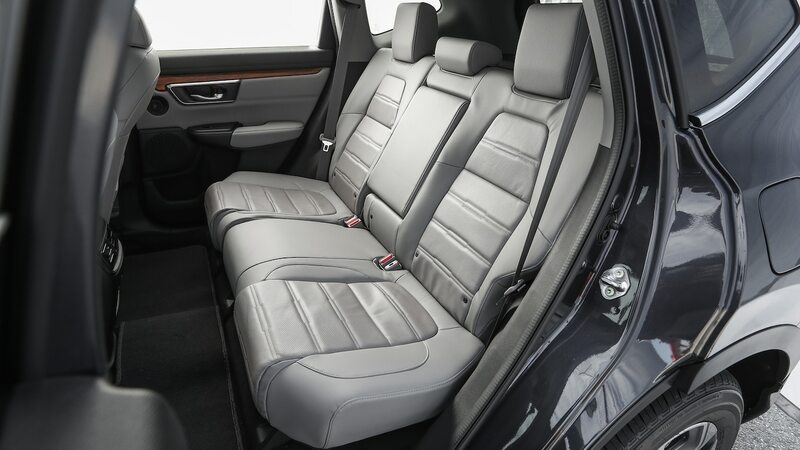 The seats, both front and back, were generally comfortable, and we like the second row’s ability to slide fore and aft, helping bring little ones and pets closer to the front seat while boosting cargo space. Nissan’s innovative Divide-N-Hide cargo system is also a versatile and useful storage solution. The Jeep Cherokee left us feeling cold, too. 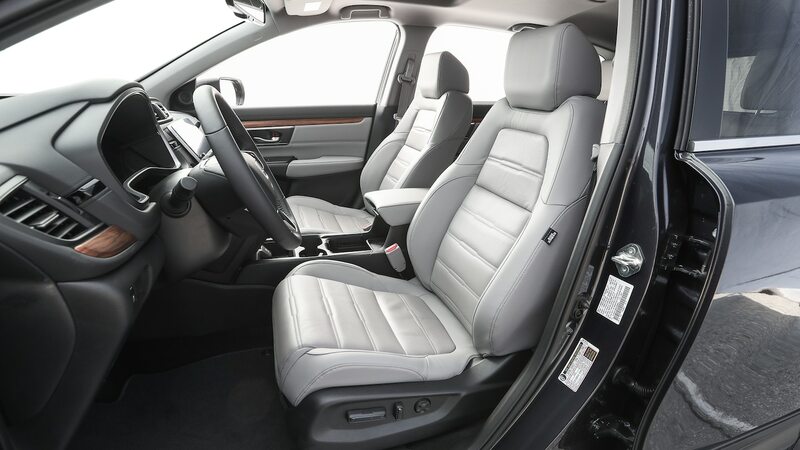 True, the Cherokee’s cabin was significantly updated for the 2019 model year, but it will take more than its $34,720 USD as-tested price tag to reap most of those benefits. The most obvious issue is front and center. Gale blanched at the obvious cost-cutting of the tiny standard infotainment screen and the three obviously blanked buttons directly beneath. 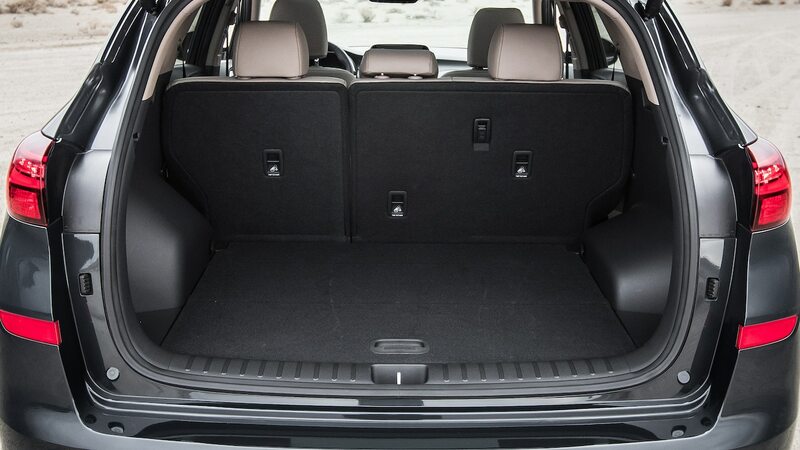 The Jeep suffers from an overall lack of space, whether it’s the shortage of usable storage cubbies for your keys or phone or the cramped back seat. Fortunately, the cargo hatch opening is now wider than before. 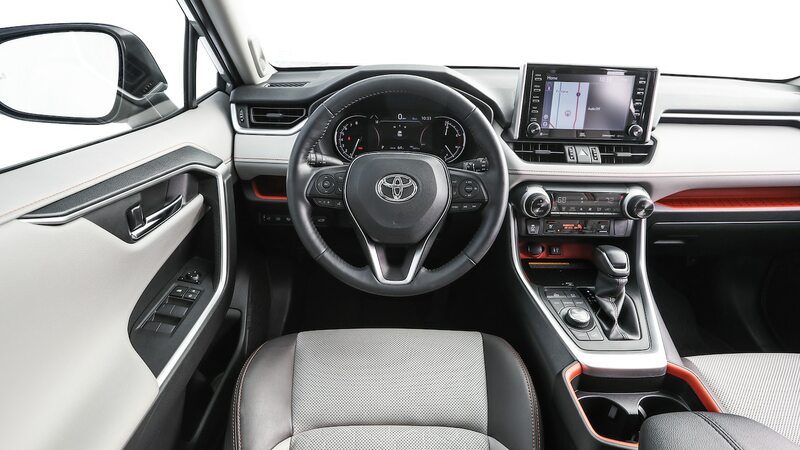 Meanwhile, Toyota went fun and funky: “Great interior design, mix of materials, and ergonomics on the RAV4,” associate road test editor Erick Ayapana said. 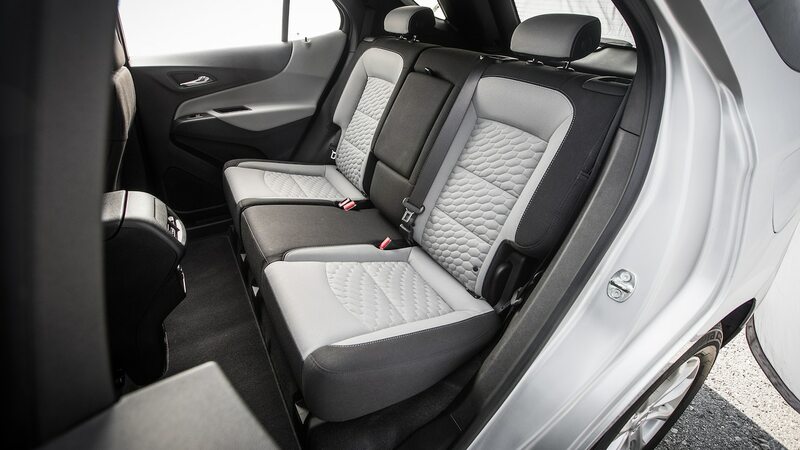 Gale agreed: “These geometric patterns on the seats, in the cargo area, and the Qi wireless charging are fantastic. 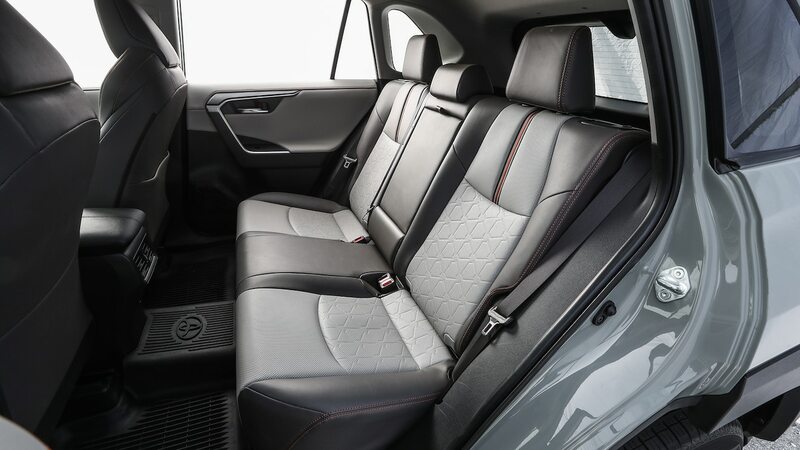 That, along with the Adventure trim’s multicolor seat stripes, makes this trim’s design feel special.” Look past the Adventure-exclusive trim, though, and the Toyota falls down a few pegs. Headroom up front is pinched, and legroom in back is noticeably worst in class. 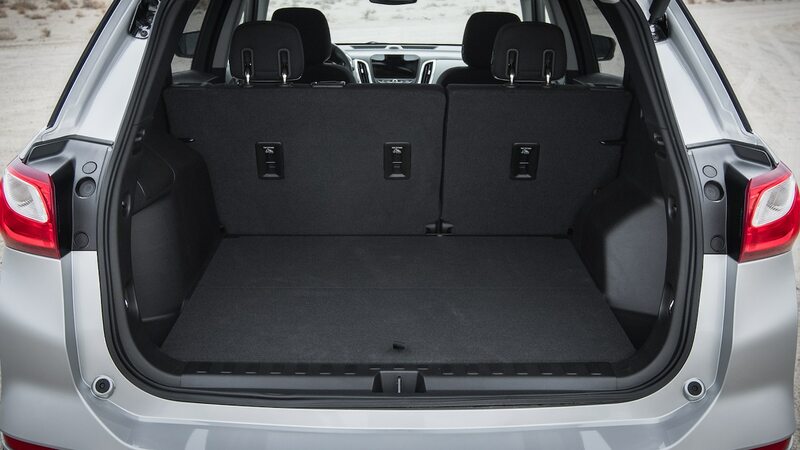 The cargo area is also of limited practical use with the rear seats folded—they don’t fold flat and have hard plastic bulbs at either corner that’ll ensure your stuff doesn’t lie flat, either. While others went playful, Mazda impressed us with its maturity. 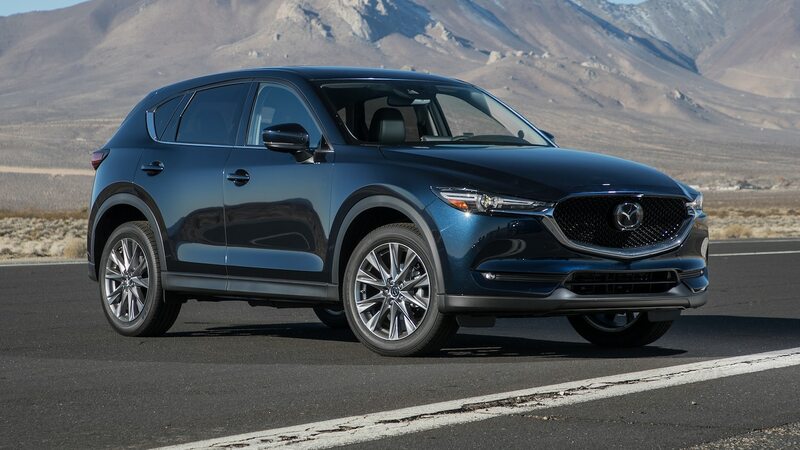 The driver-focused CX-5 Grand Touring is merely a Lexus badge away from bougieing its way out of this comparison test. 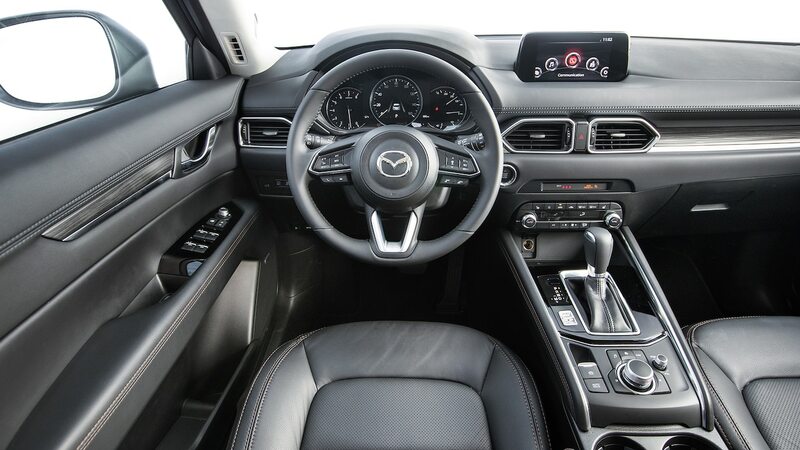 “Mazda has a much more upscale look and feel inside; all materials seem classier,” Markus said. The cabin—finished in a faux zebra-grained wood, contrast-stitched leather, satin accents, and revamped high-resolution displays—is sure to make you feel good about your purchase each and every day. From a practicality standpoint, there’s room for improvement. Storage space for keys, phones, a stick of gum—let alone drinks—is at a premium up front. In back, most editors found the rear seats to be tight. 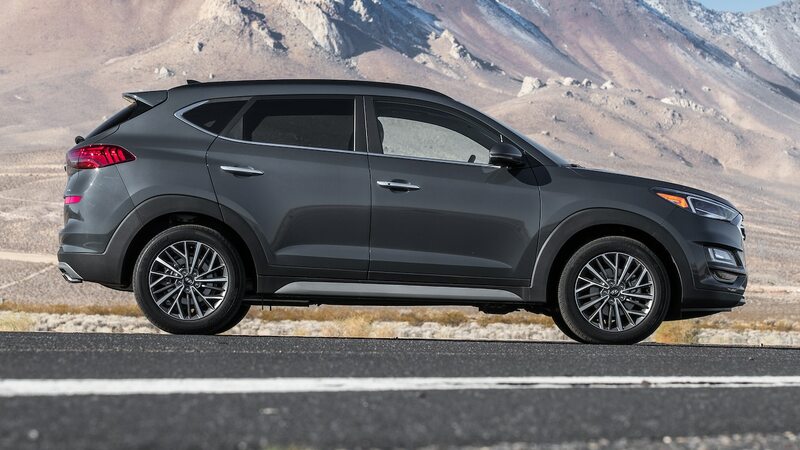 The Hyundai Tucson also looks premium. 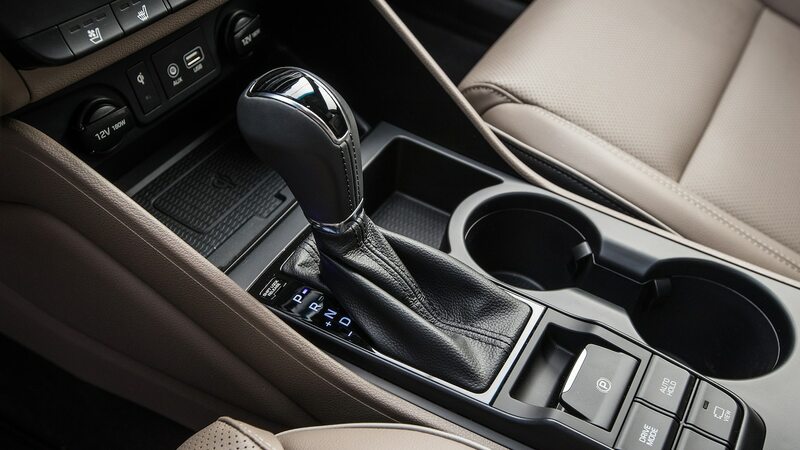 The black and tan palette gives the cabin an elegant and open feel, and all of the controls are thoughtfully arranged. 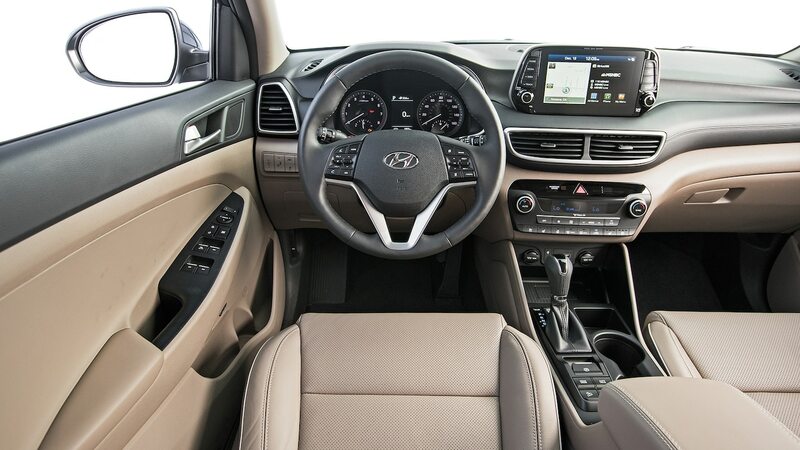 “Hyundai remains a leader in infotainment,” Evans said. “Its user interface is friendlier and cleaner than anyone else’s, and you still get all the redundant buttons you need.” Although the Tucson’s interior looks rich, it doesn’t always feel it; some of the switchgear feels brittle and cheap, and we’re no fans of the scratchy plastics on the doors and backs of the rear seats. Safety is important in any segment but especially so when a vehicle is tasked primarily with carting around your family. 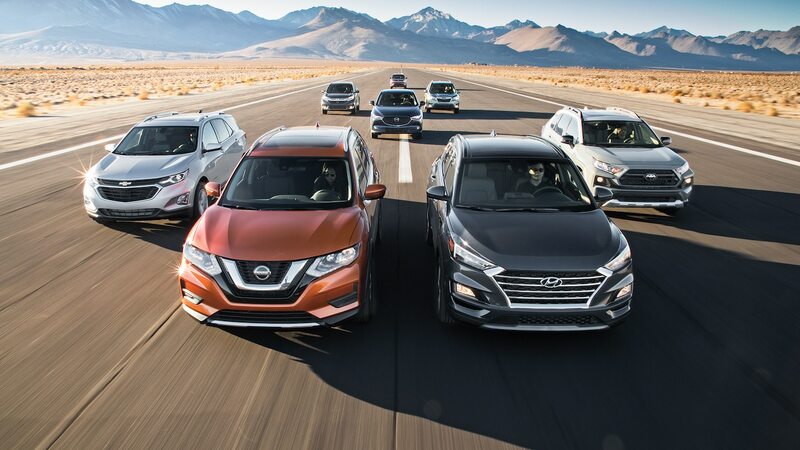 Remarkably, all eight of our crossovers performed well on both NHTSA and IIHS tests. Only fractions of a point separate the bottom of the pack from the first-place CX-5. 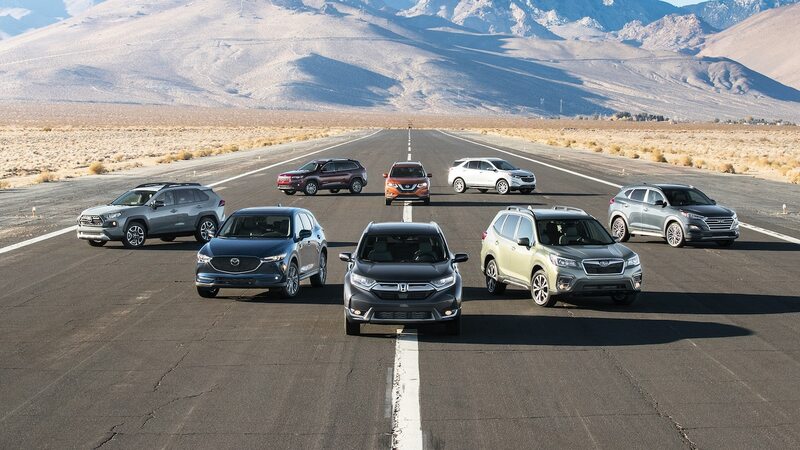 When it comes to technologies that help you avoid an accident in the first place, the CR-V was especially notable here. 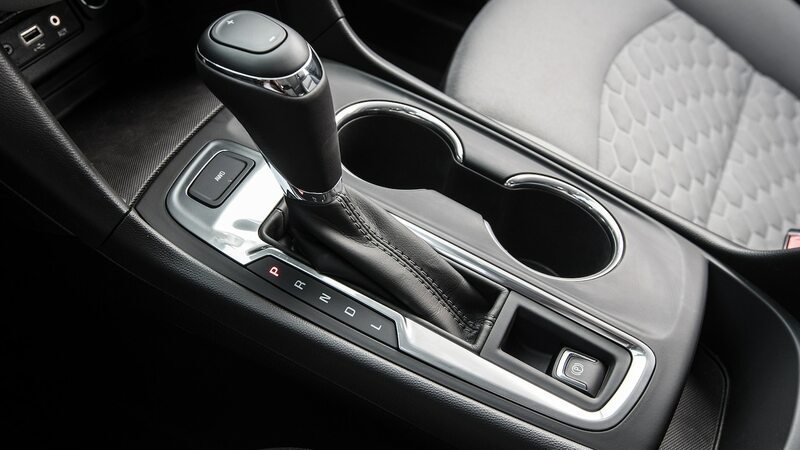 It features driver-assist technologies such as radar cruise control, forward collision alert, and lane keep assist to not only help make your ride safer but also reduce the driver’s workload. 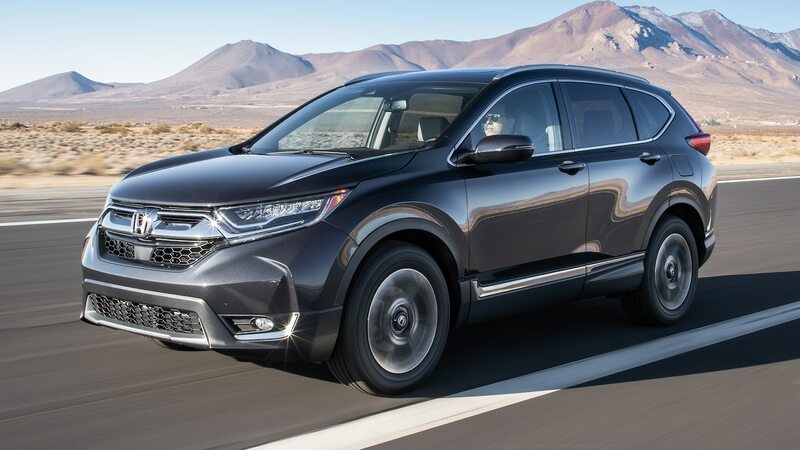 “The CR-V’s lane centering and related systems perform more smoothly and consistently than any other in this group,” Evans said. Of note: Our CR-V EX-L was damaged in an accident prior to this photoshoot. A CR-V Touring is pictured in its place. Traffic stop be damned, at least the Rogue’s system worked in optimal freeway conditions—neither the Chevy nor the Jeep had any active driver-assist technologies. 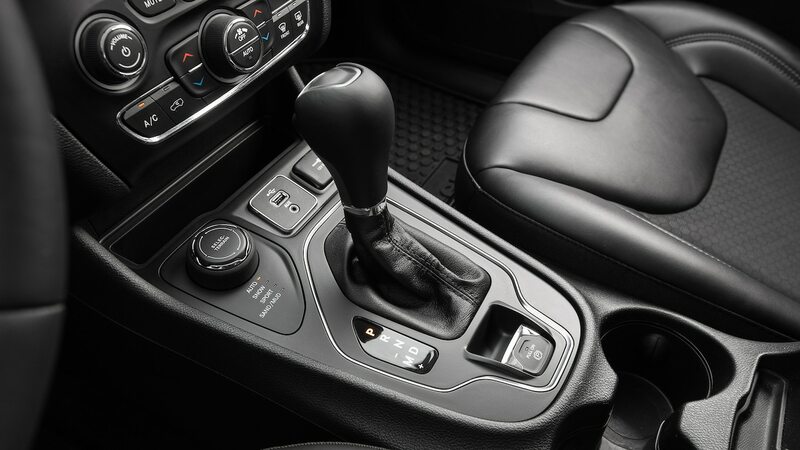 On the Equinox, radar cruise control and associated systems are only available on the top-line Premier model, and on the Cherokee, Jeep’s active safety systems become available on the midlevel Limited model. There are different methods to determine value. If you’re seeking the rock-bottom price, it’s difficult to beat our Subaru Forester Limited tester. 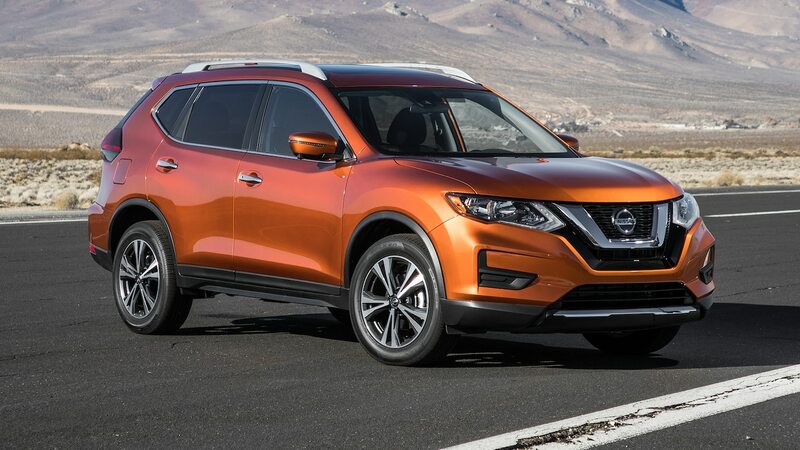 At $31,770 USD as tested, it’s not only the cheapest SUV in our group (just edging out the Honda CR-V) but also among the best equipped, with standard features such as all-wheel drive, automatic A/C, advanced driver-assist technologies, and a panoramic moonroof. 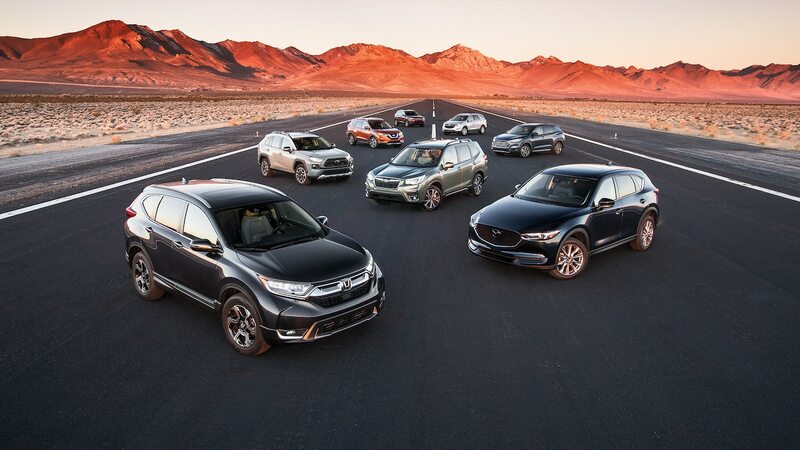 If we expand our perspective beyond the showroom floor, to IntelliChoice’s five-year cost of ownership analysis, we find that the Forester is again tops here, with the CR-V hot on its heels. PURCHASE PRICE: Target purchase price includes destination and average applicable state taxes applied to a transaction price between invoice and retail, based on applicable incentives. At the end of a whirlwind week of testing, the reasons why so many Americans are moving from sedans to crossovers really becomes clear. 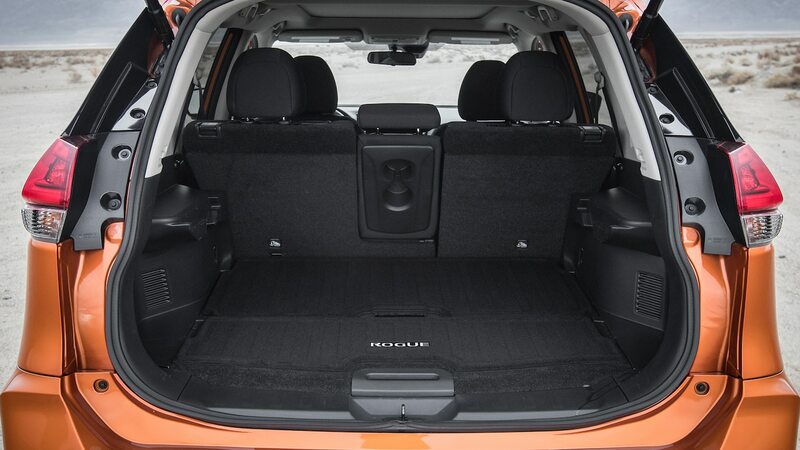 In a world where the budgets of middle-class families are being pinched, these compact crossovers are a practical way to have much of the functionality of a two-car household with just a single vehicle. Even so, some are better buys than others. And there are sizable gaps between those vehicles we recommend and those we do not. 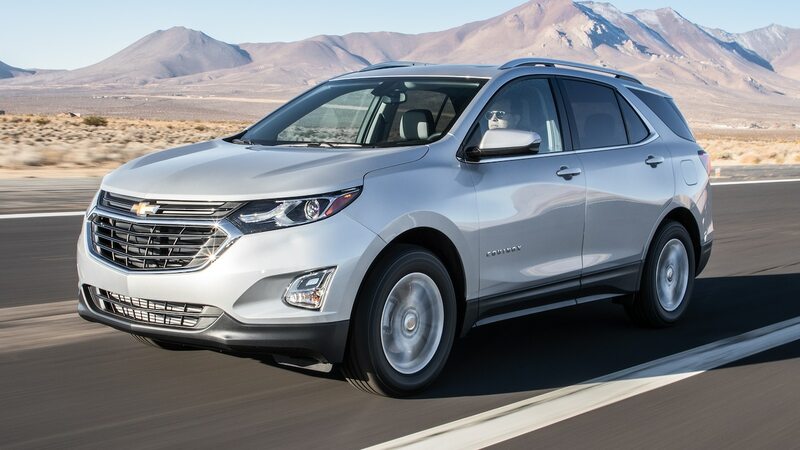 It’s safe to say that the 1.5-liter Chevrolet Equinox LT falls into the latter category. Nearly every judge ranked it last. Its infotainment system and its generally roomy cabin were pluses, but that’s about where the positives end. It’s true that there are really no “bad” vehicles for sale anymore, but there are some wildly uncompetitive ones. 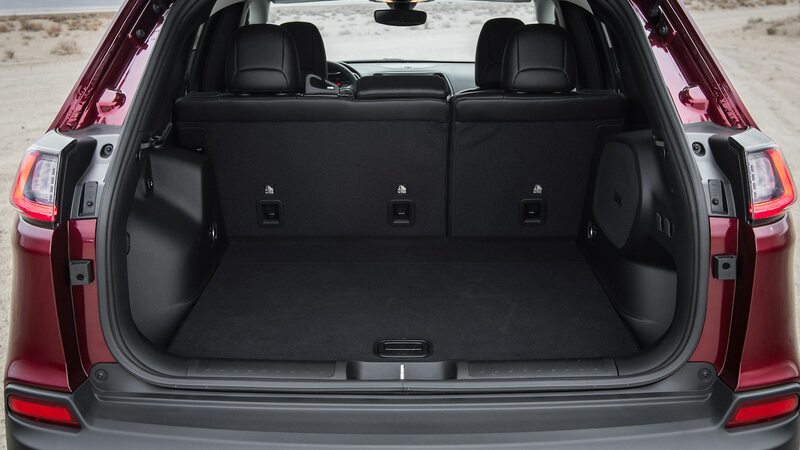 The Chevrolet Equinox LT fits that bill. Although we were quick to put the Equinox out to pasture, we were more reluctant doing so to the seventh-place Jeep Cherokee Latitude. 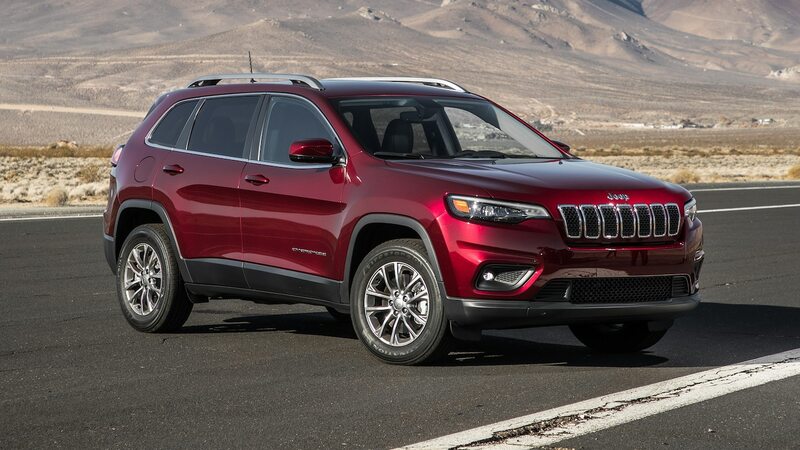 There are many compromises to be found in the Cherokee at this price point—its bare-bones interior and lack of advanced safety tech chief among them—but there’s a certain charm and performance credibility to the Cherokee that’s lacking in most of the segment. 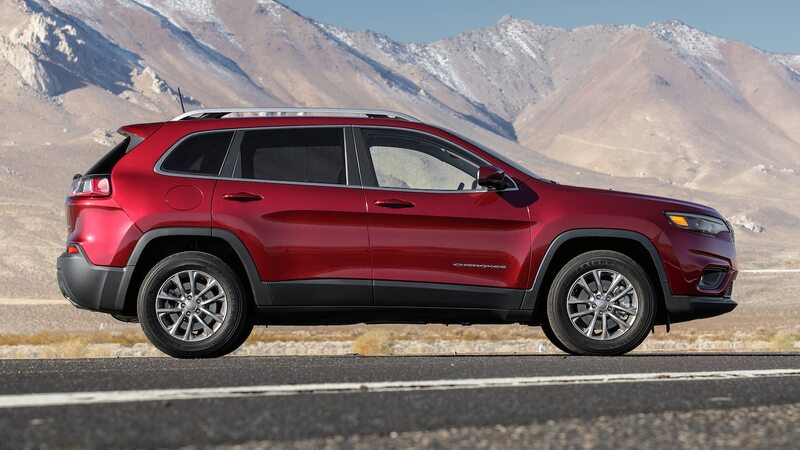 And if you’re planning to take your compact CUV off-roading, bump the Cherokee to the top of your list. 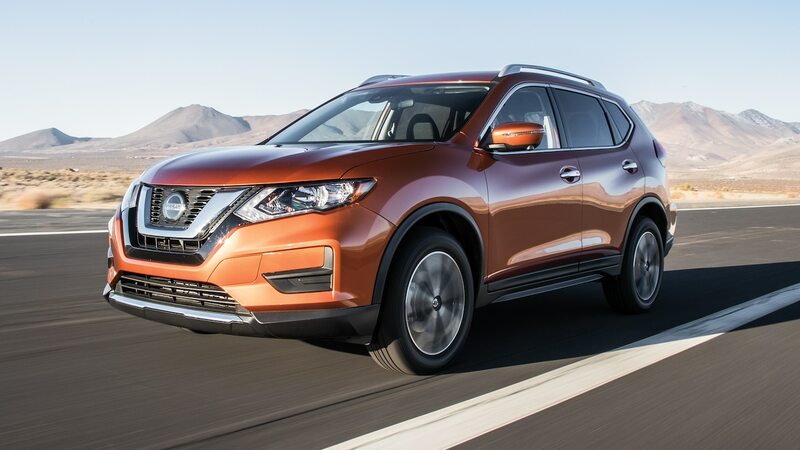 The Nissan Rogue SV sits ahead of the Jeep by the slimmest of margins; its high feature content, comfortable seats, and quality packaging help it edge out the Americans. Still, there’s no overlooking its aging underpinnings, unreliable driver-assist systems, and an infotainment system that feels more RadioShack than Apple Store. It’s hard to overstate just how wide of a gulf separates our top five finishers from the back of the pack—and the gap between fifth through second place is so tight that a single vote change could have significantly altered our finishing order. In other words, it’s hard to go wrong with the rest of our field. Put it down to personal preference. There should be no shame at Hyundai about its fifth-place Tucson Ultimate. 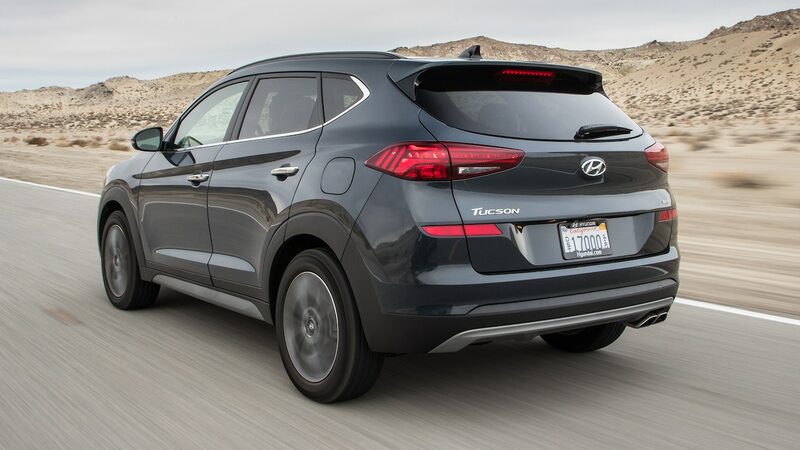 A solid all-around SUV, the Tucson is stylish and upscale, with a comfortable cabin that’ll leave you feeling good about your purchase long after the new car smell wears off. But despite its fairly extensive midcycle refresh, the Tucson still lacks the cabin refinement and driving experience details that the class leaders have. Fourth place goes to the Toyota RAV4 Adventure. 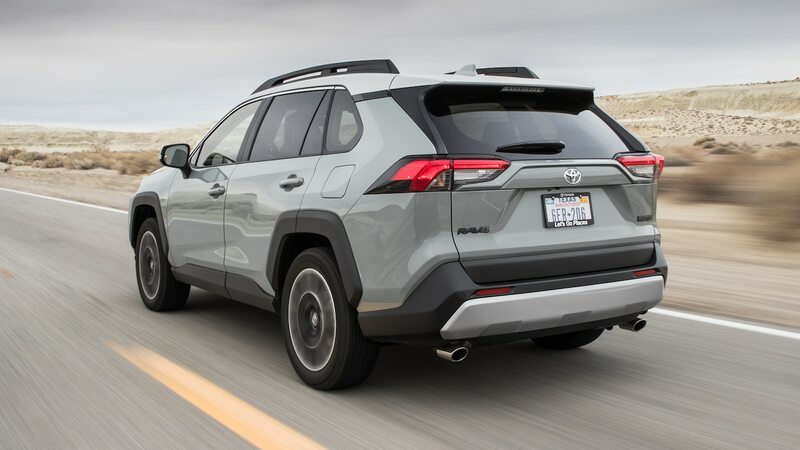 At first glance, the new RAV4 is a massive upgrade over the old one. For starters, it’s been cohesively and fabulously designed both inside and out, sporting the look of a reimagined FJ Cruiser. But the Toyota team missed out on some key points it normally nails. An unimpressive powertrain, rear doors that don’t open very wide, rear seats that don’t fold flat, and an overall cramped cabin negate many of its design advantages. Like the RAV4, our third-place finisher shows promise but falls short. The Subaru Forester scores incredibly high in its general appearance and design vibe, and it’s an outstanding value. But its underpowered engine and poorly controlled ride will have you doubting your purchase decision even as you count the money you saved. Always the bridesmaid, never the bride—this seems to be where the Mazda CX-5 Grand Touring finds itself. It’s no secret we love the CX-5. Quite simply, no other vehicle in this group focuses on exciting and delighting the driver more than the Mazda does. 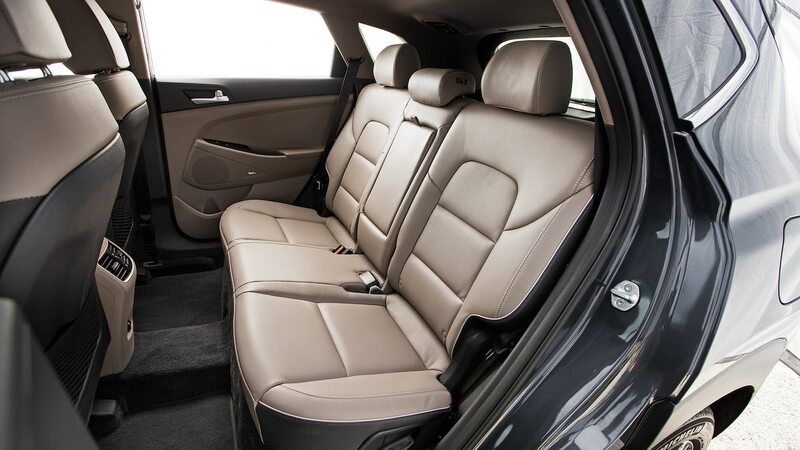 Its exterior look is sharp, its interior design is elegant, and its driving feel is precise. 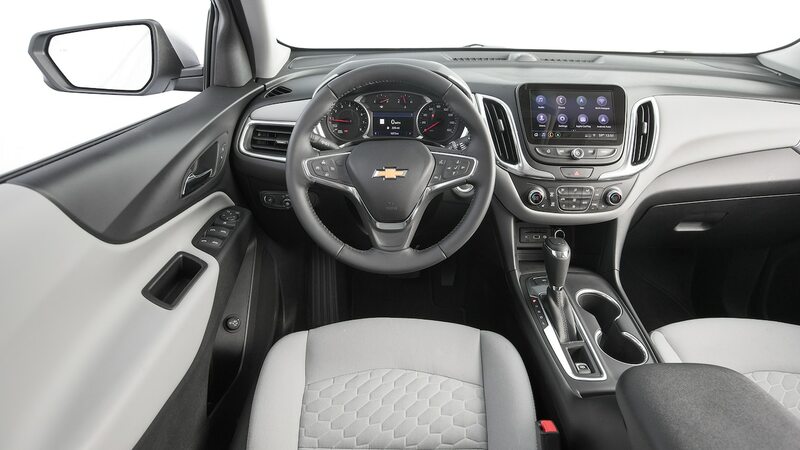 If you put driving ahead of functionality, this is the crossover for you. 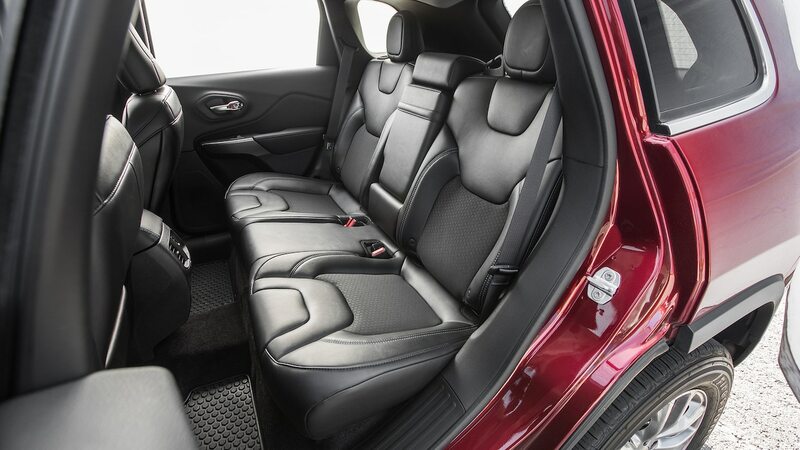 But this is a Big Test, and as such the CX-5 gives up ground in key areas, falling short on overall packaging, passenger space, and cargo room to our winner. I’m sure you’ve done the math by now—our winner is the Honda CR-V EX-L. 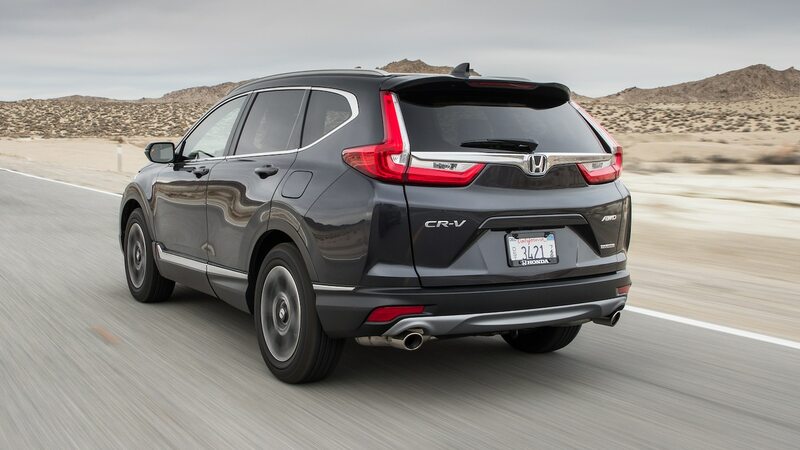 It seems that no matter what challenge we throw at the fifth-generation CR-V, it excels. 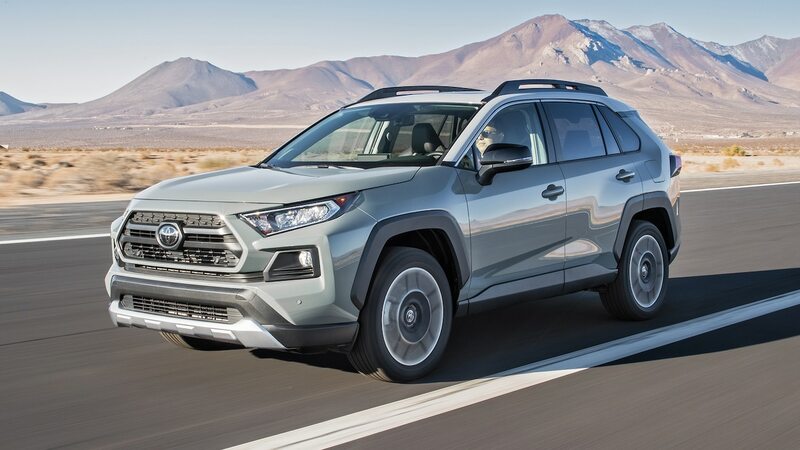 In the past, it has vanquished both the CX-5 and new RAV4 in stand-alone comparison tests, and it beat out 23 other SUVs to earn our SUV of the Year award in 2018. Now with the whole of its competitive set assembled, the CR-V shines again. 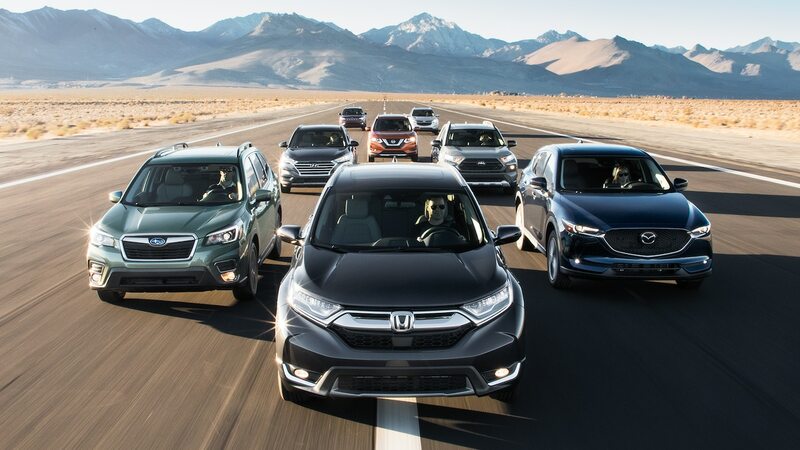 No crossover provides a better overall balance than the Honda. It’s fun to drive yet still comfortable. It’s quick yet efficient. It’s affordable yet still well equipped. And it’s compact outside and spacious inside. 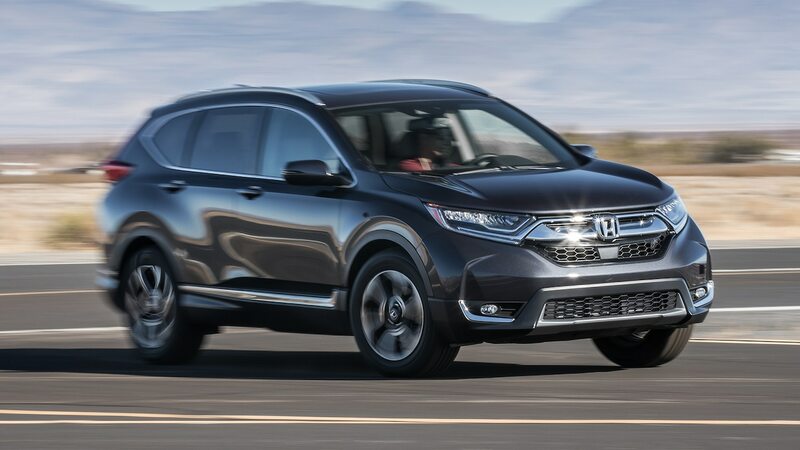 The Honda CR-V is not only the best in this segment, but its crossover appeal should also put it on the short list of anyone shopping for a new family ride of any shape or size. 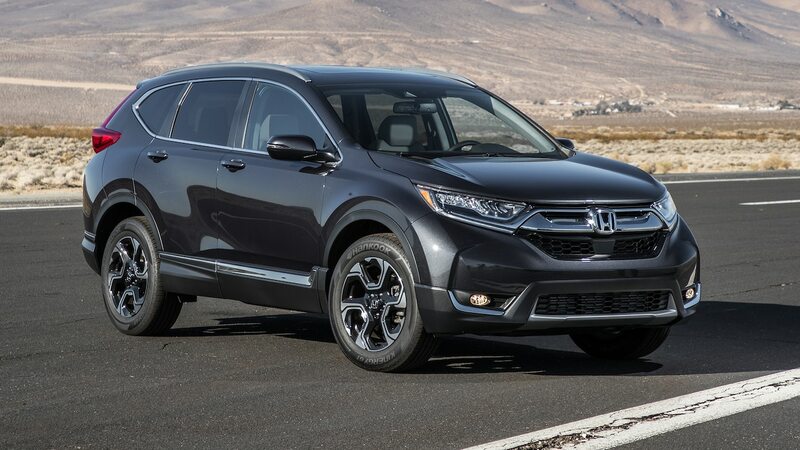 With a CR-V this good, it’s easy to see why the sedan is on its way out. Best driver’s crossover, with sharp design inside and out. Fix the suspension and give it some horsepower. Then we’ll talk. Great design, underwhelming chassis and powertrain. A mild update away from top-three contention. Again. 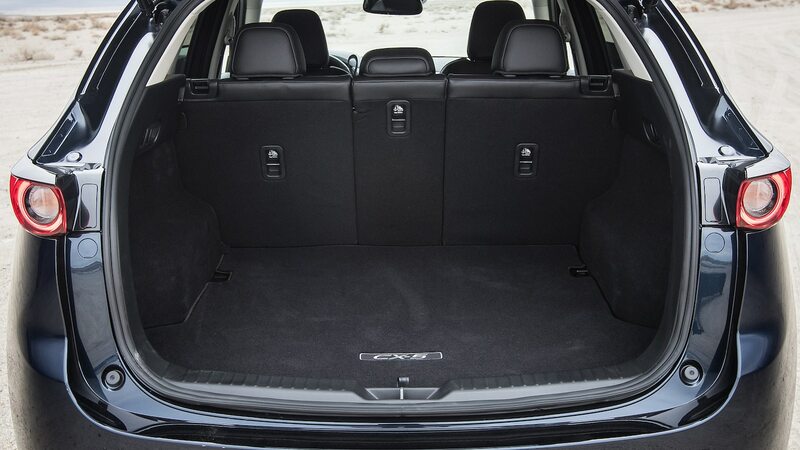 Great back seat and cargo package but falls short on quality and refinement. All the charm of a puppy but with all the drawbacks, too. Feels like it was designed to be rented, not owned.